I must have been going to the Cutty Sark pub in Greenwich for well over 45 years. 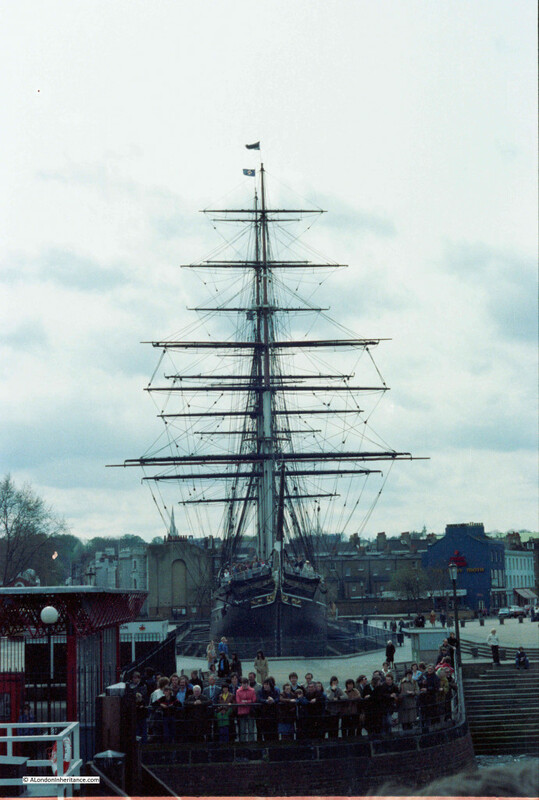 I can just about remember the first trips, where as part of a family day out to Greenwich, after feeding the squirrels in the park, walking down to the Cutty Sark ship and the old Gypsy Moth IV, Francis Chichester’s boat in which he circumnavigated the world single handed in 1967, we would walk along the river to the Cutty Sark pub for a soft drink and crisps. 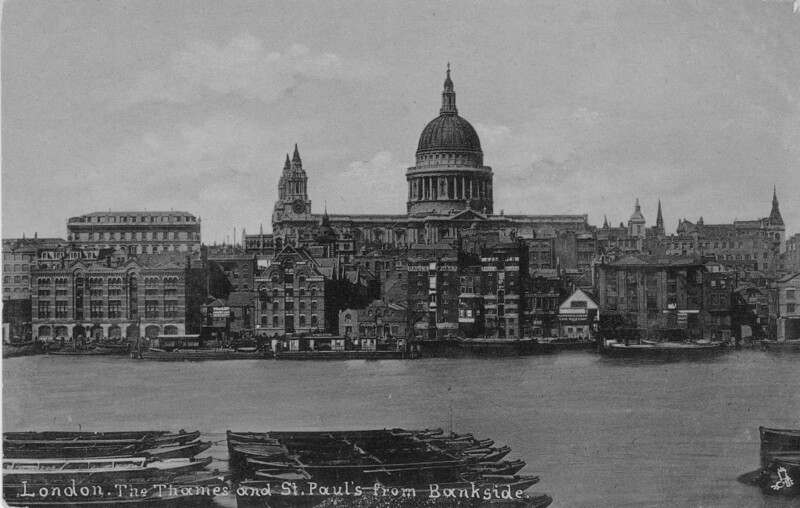 The walk along the river was different to that of today. 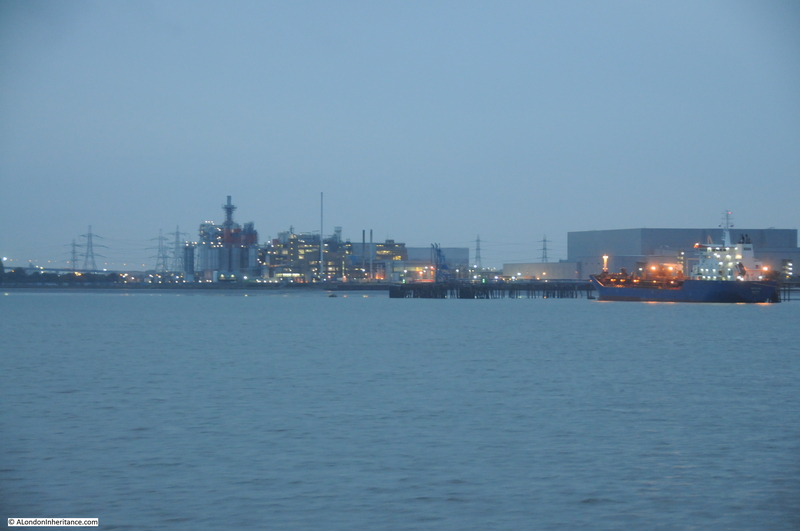 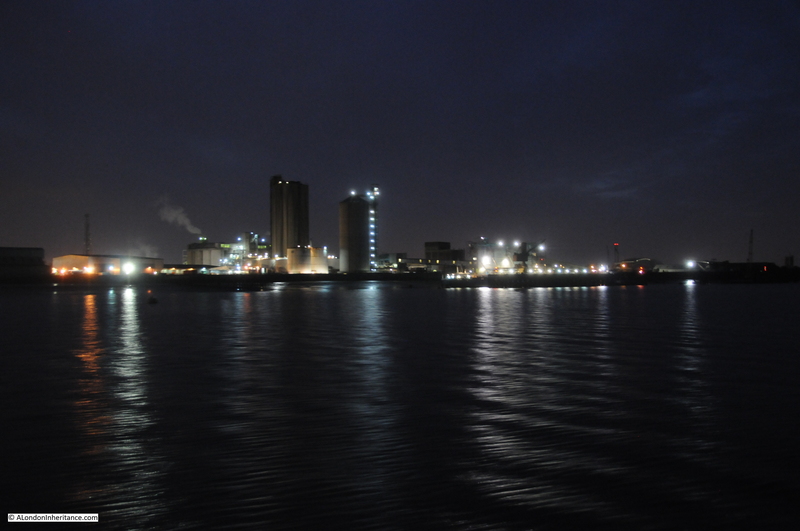 It was much quieter and the industrial nature of the Greenwich Peninsula extended up to the Greenwich Power Station. 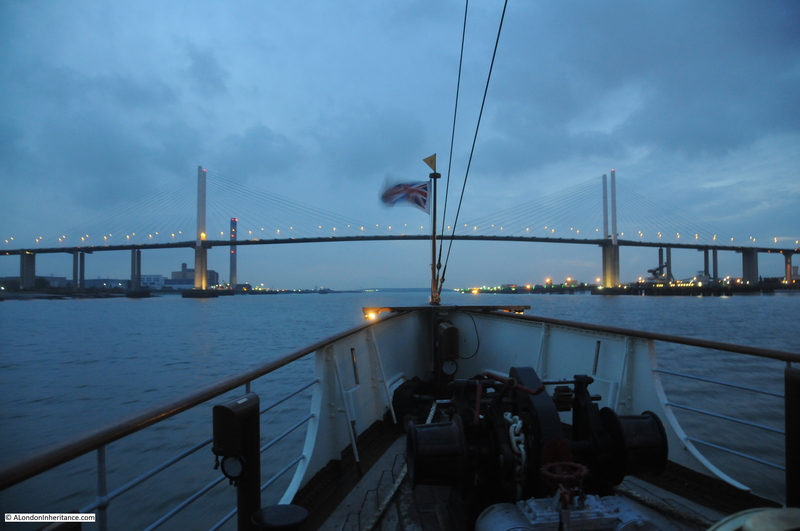 My father would tell us stories along the way. 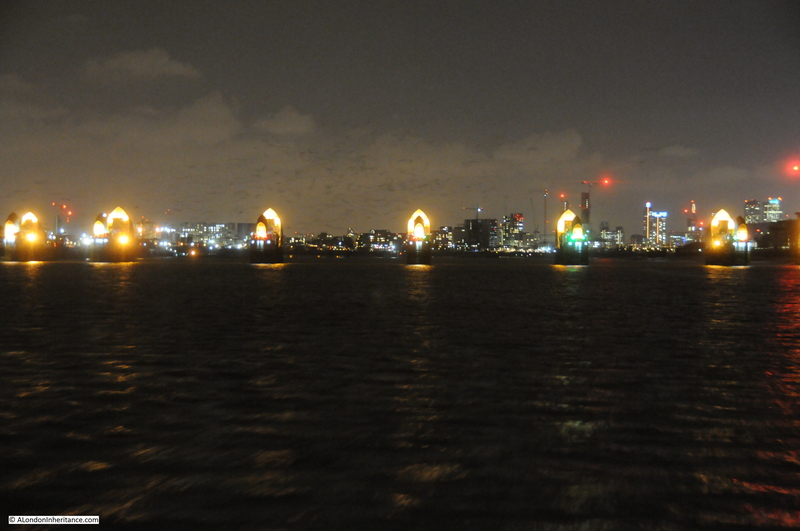 Along the narrow walkway between the River Thames and the old Royal Naval College he would tell of people being robbed along here at night with the threat of being thrown in the river if they did not comply – no idea if these stories were true, or whether they were to keep the interest in a walk, but I could imagine this happening on a dark night with mist drifting across from the river. 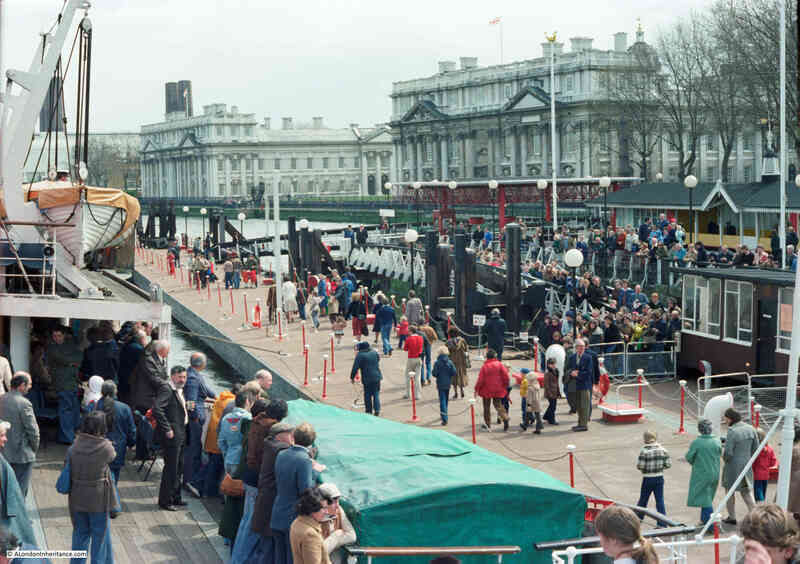 To get to the Cutty Sark pub, it was a walk in front of the Royal Naval College, past the Trafalgar Tavern, Trinity Hospital and Power Station. 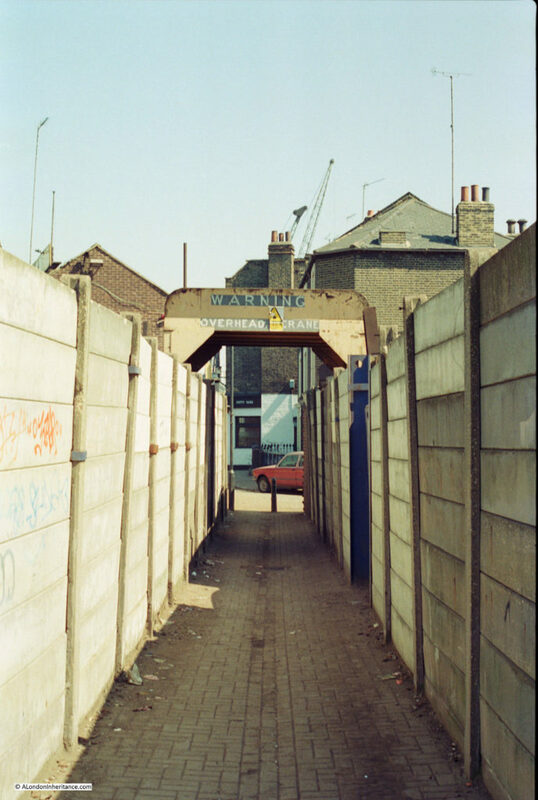 There was then a short walk through a scrap metal yard to get to the pub. 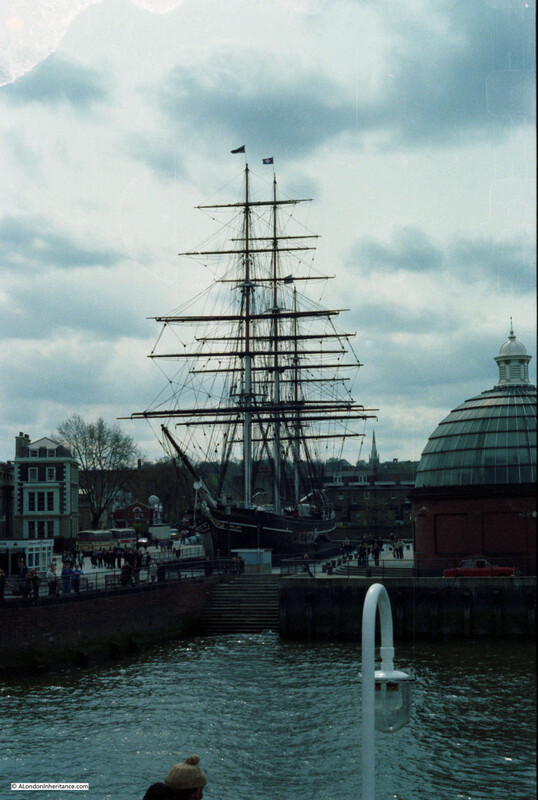 A couple of months ago, I scanned some negatives and among the photos were some I had taken in Greenwich, including these photos which were probably taken in 1986 (plus or minus a year – I did not date these negatives, but judging by other photos on the same negative strips they are from this time). 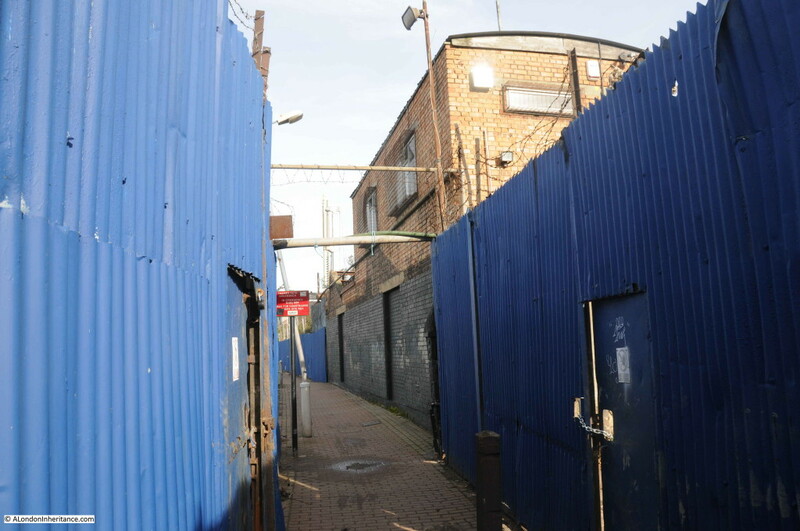 The scene today is so very different. 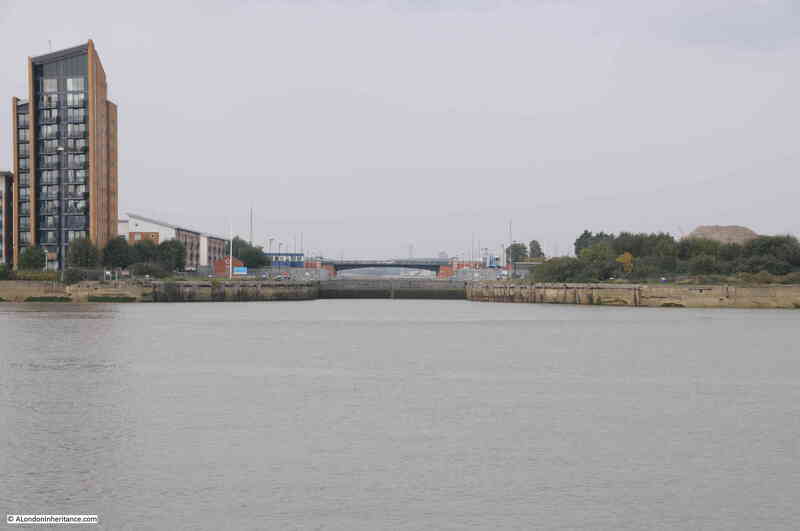 As part of the de-industrialisation of the area, the scrap yard has been cleared, space opened up to the river on the left and flats built to the right. 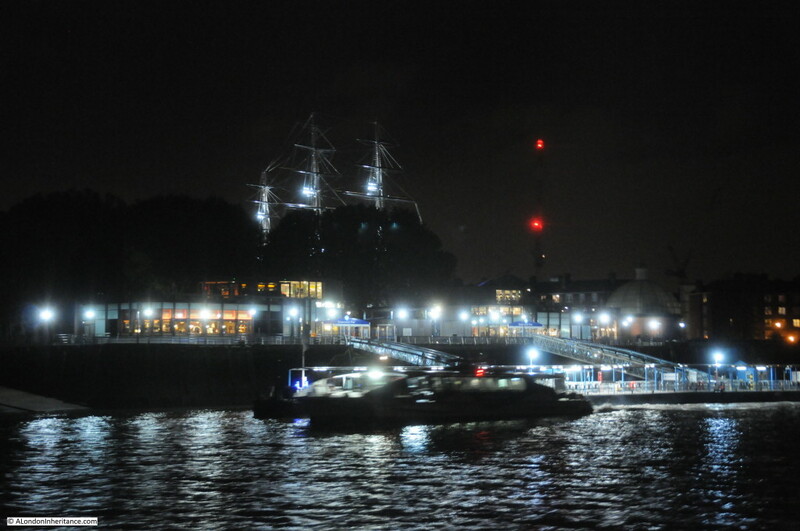 The Cutty Sark pub is in a superb location. 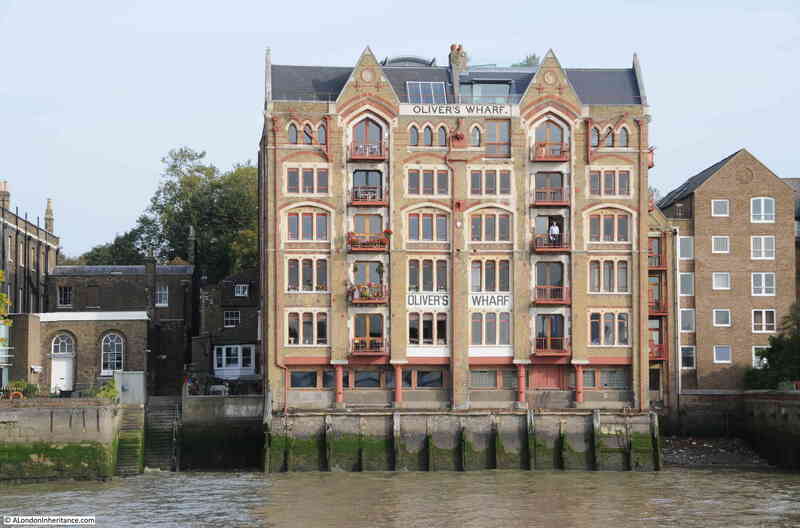 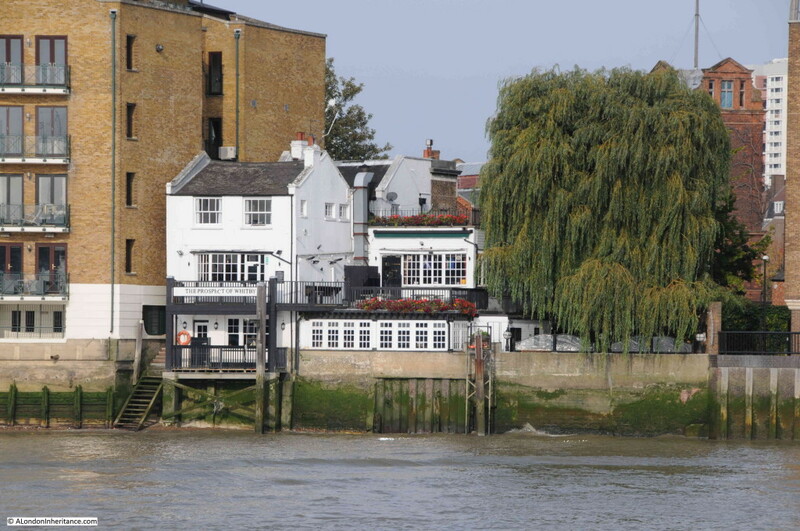 An early 19th century building (although a pub had been on the site for many years prior to the current building), it looks out over the river, providing views to the east and west. 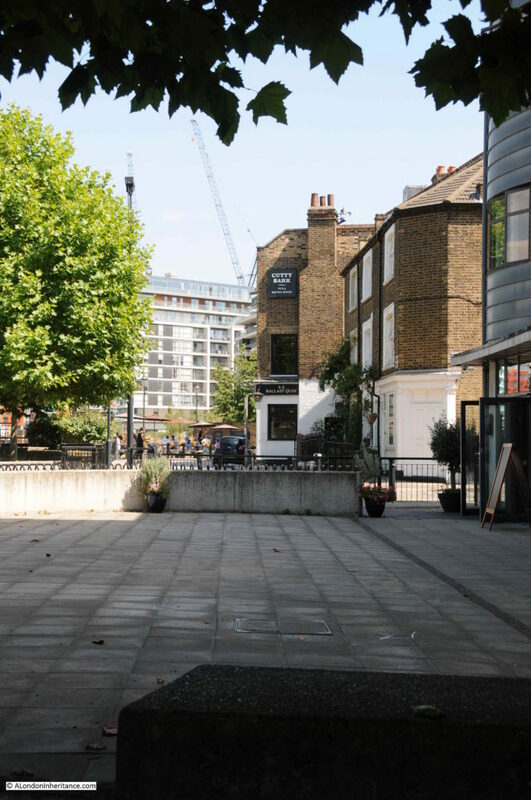 We sat outside on a hot day in early August 2018 during the visit to take these photos, something I dream about doing again whilst writing this on a cold, grey and overcast January morning. 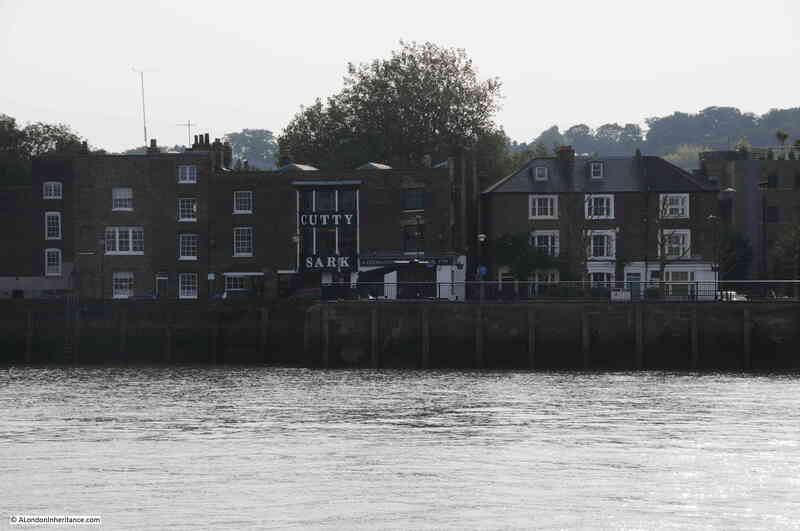 The current name of the pub is relatively recent, only being named the Cutty Sark in 1951 when the ship of the same name first arrived in Greenwich. 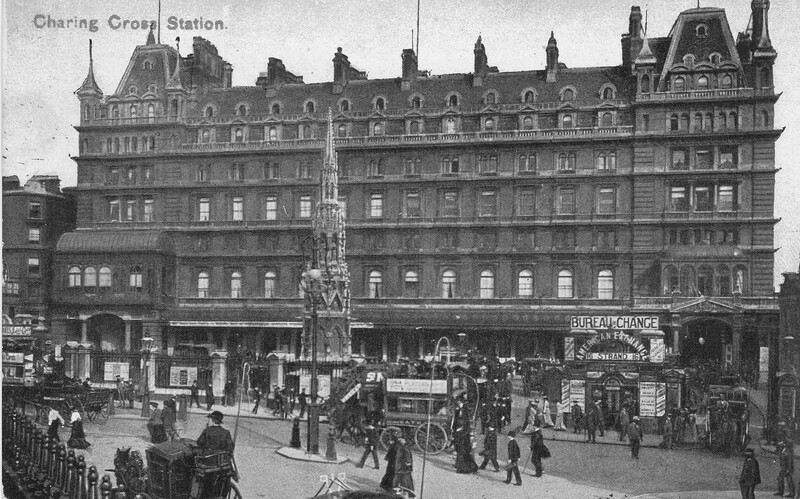 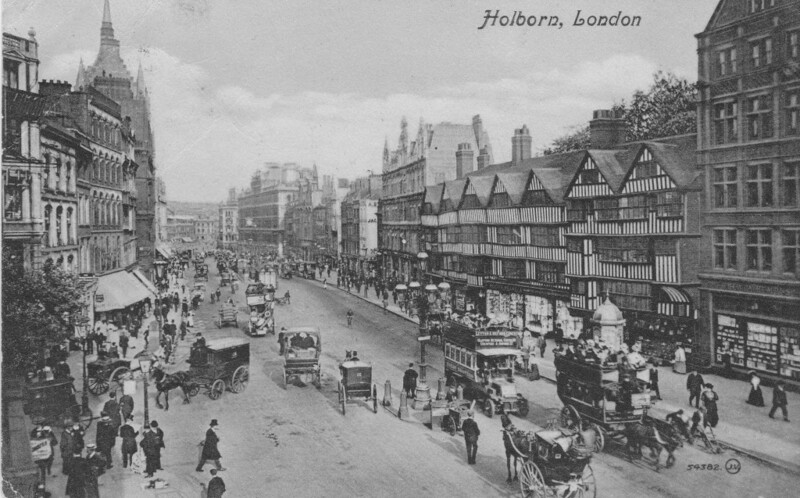 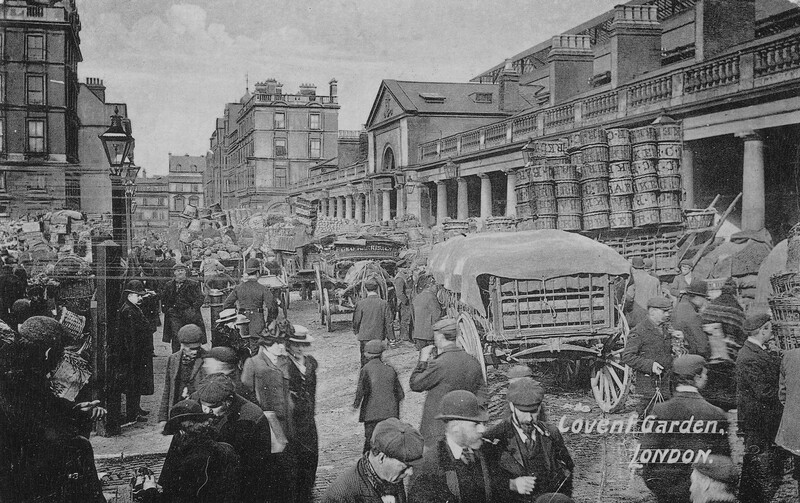 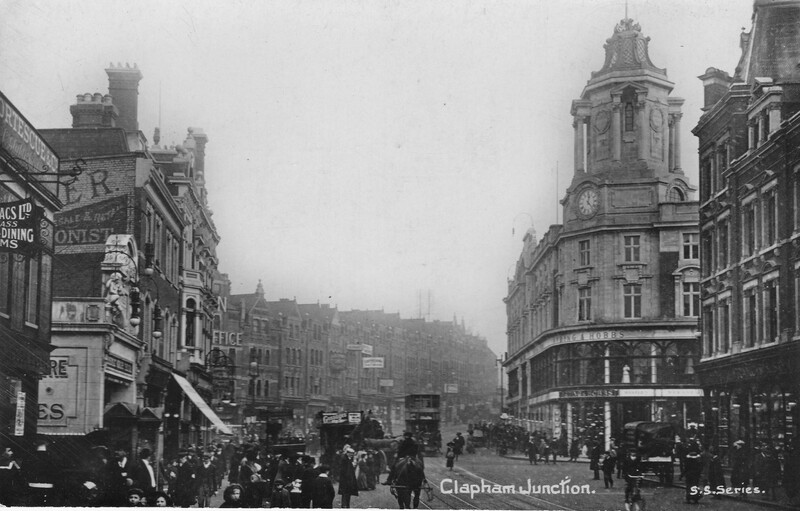 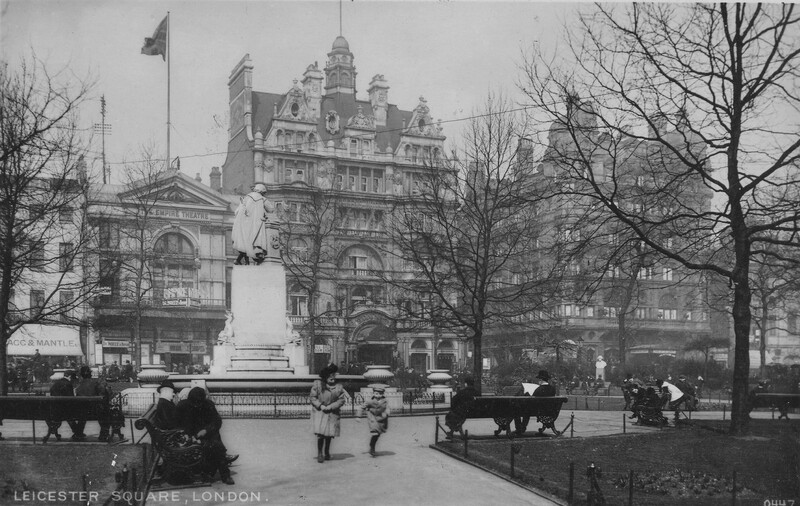 Originally the pub was called the Green Man, then from 1810 it was named the Union Tavern. 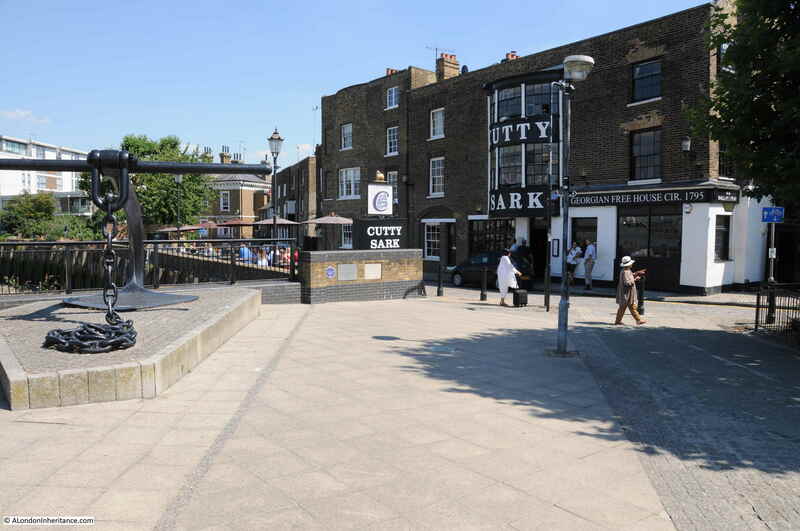 After clearance of the scrap yard, the Cutty Sark pub now enjoys a large open space to the west along with a seating area directly in front of the pub. The middle plaque informs that the foundation stone on the right was from the old metal recycling yard that occupied the space. 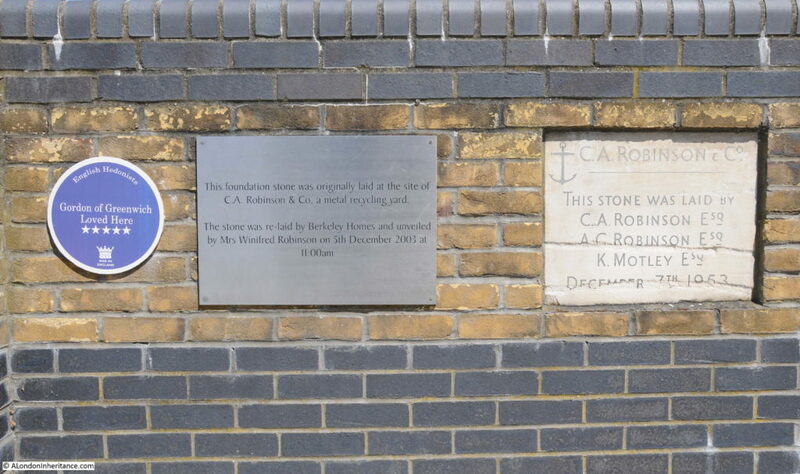 I have not been able to find any information as to the blue plaque on the left, and who was “Gordon of Greenwich”, There are English Hedonists plaques in other parts of London, created as an artwork, but the Greenwich plaque does not appear to be included in lists of these other plaques. 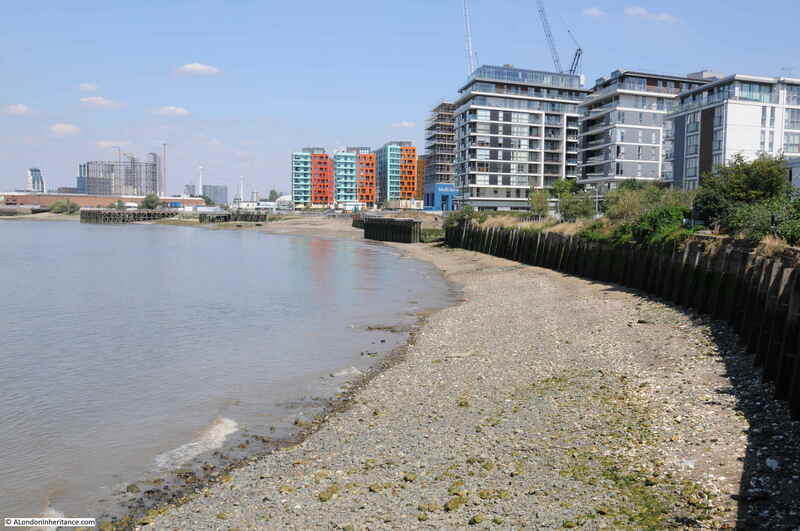 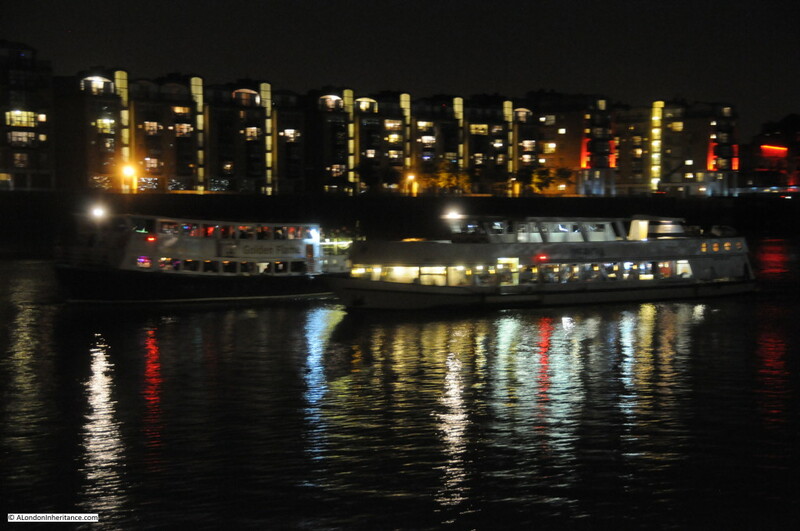 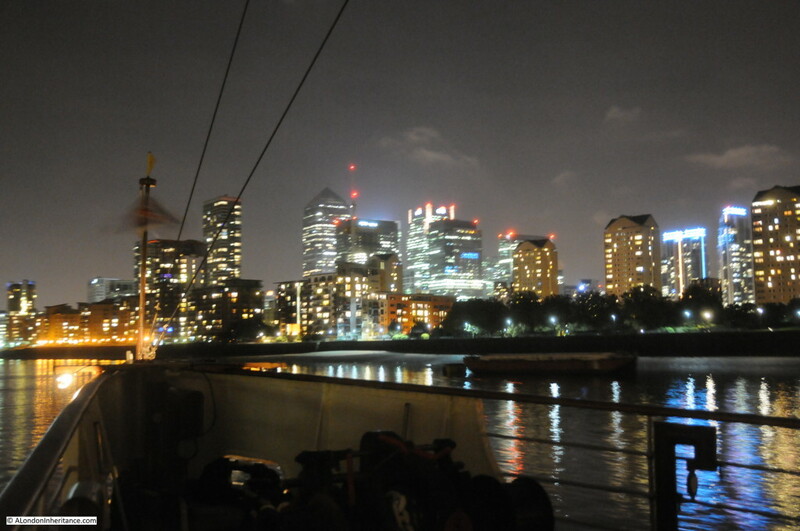 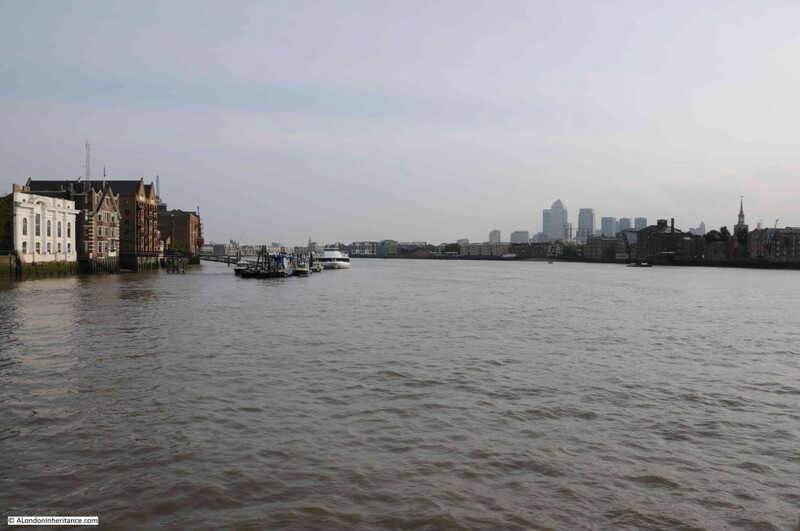 The area around the Cutty Sark pub is an ideal point to view the river and the western edge of the Greenwich Peninsula. 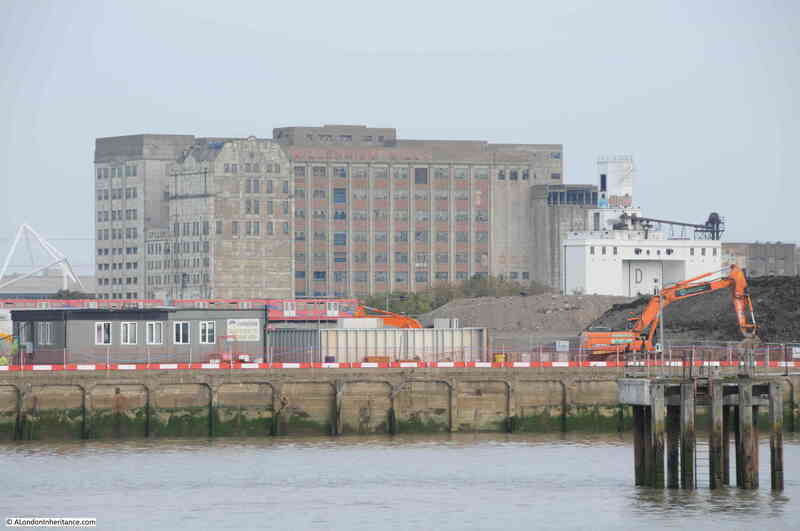 The closure of industry along this stretch of the river is almost complete and it is undergoing a similar transformation to much of the rest of the river, with blocks of flats being built, the first of these can be seen in my photo earlier in the post showing the view from where the scrap yard once stood, with a tall block of flats taking up the area behind and to the left of the Cutty Sark pub. Apart from the curve of the river, the only recognisable feature in both photos is the gas holder further down the peninsula. 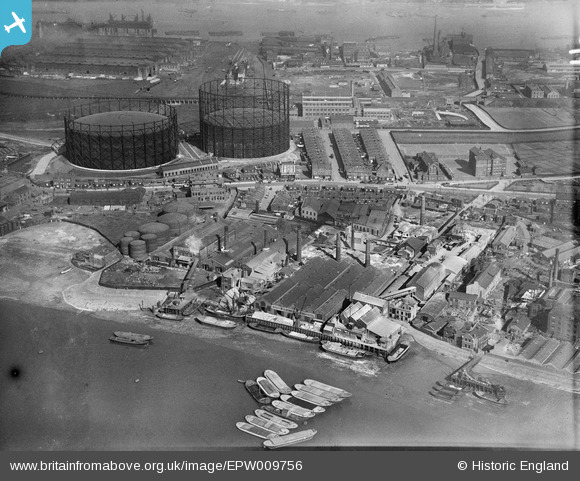 This was originally one of a pair of gas holders, the largest of their type when constructed. 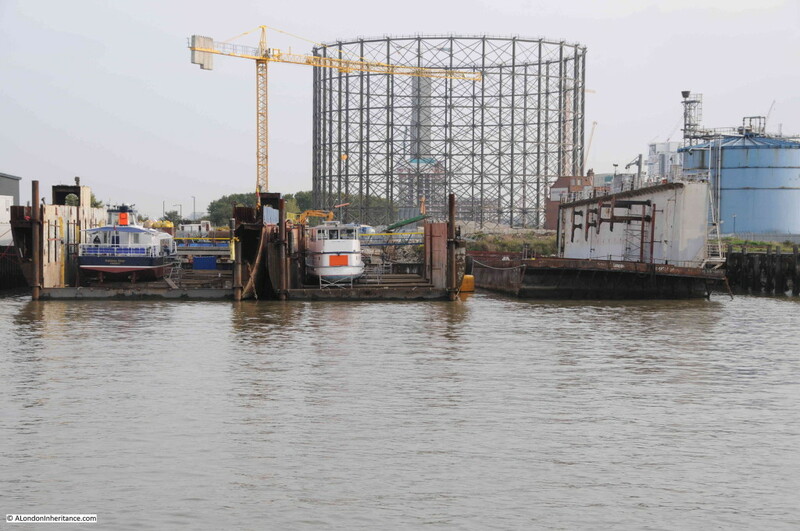 One of the gas holders was demolished in 1986, fortunately one survives. 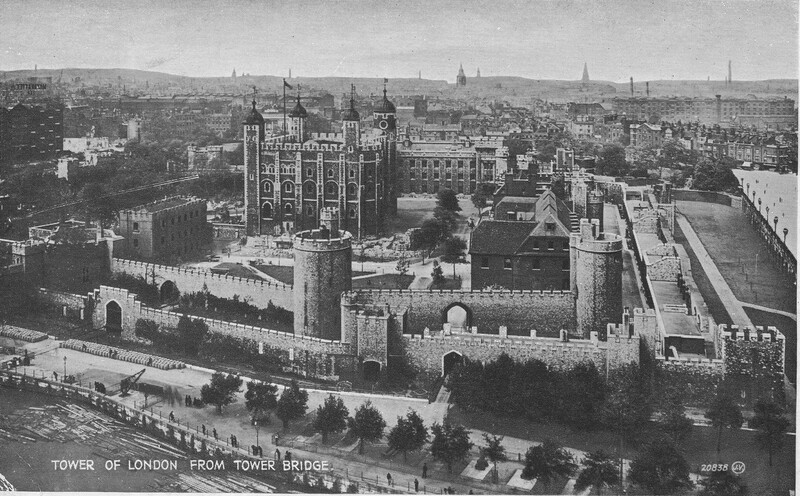 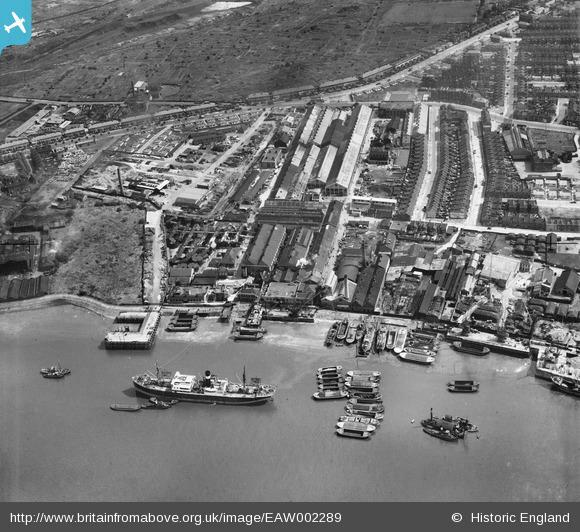 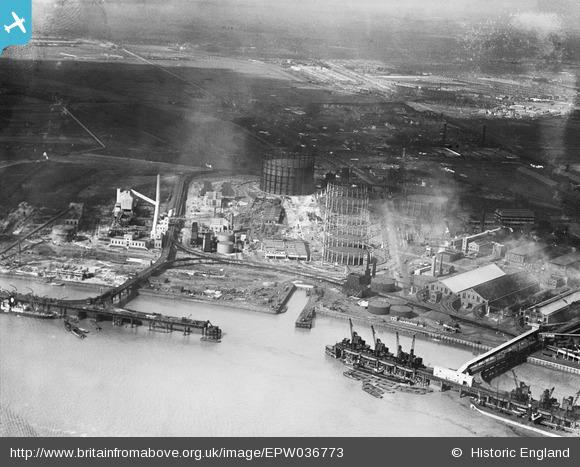 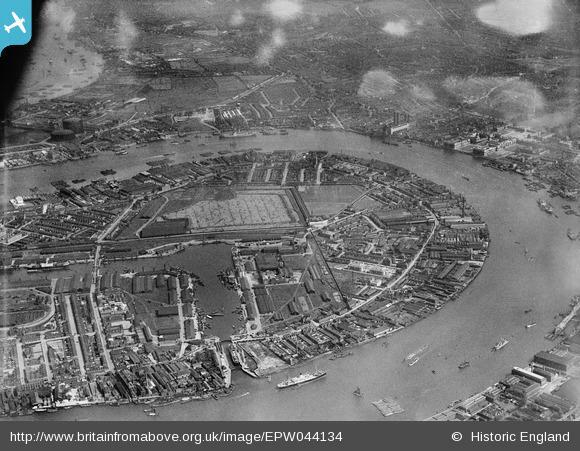 This photo from Britain from Above shows the pair of gasholders in 1924 and the surrounding industrial landscape. Two large concrete silos can also be seen, shown again in the following photo which was taken from the edge of the scrap yard. 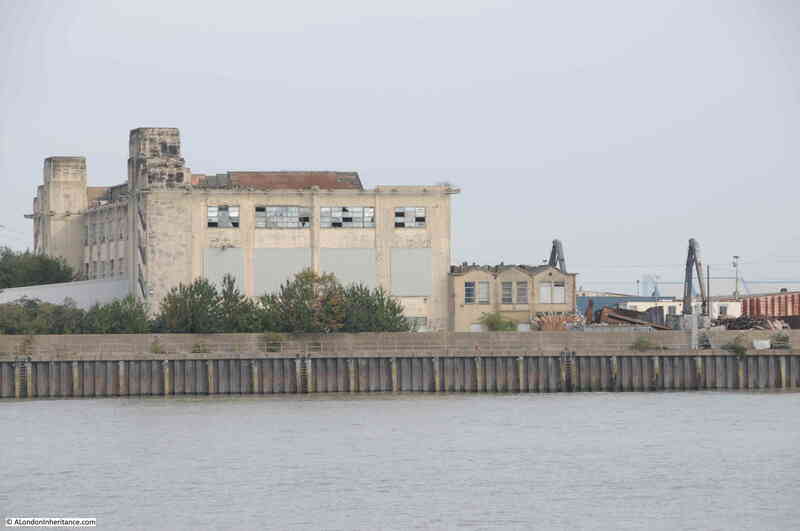 These were the storage silos of a sugar refinery which, as with much of British industry in the past few decades, went through a number of changes of ownership before being bought in 2007 by a French company and then being closed two years later, with demolition of the silos following soon after. 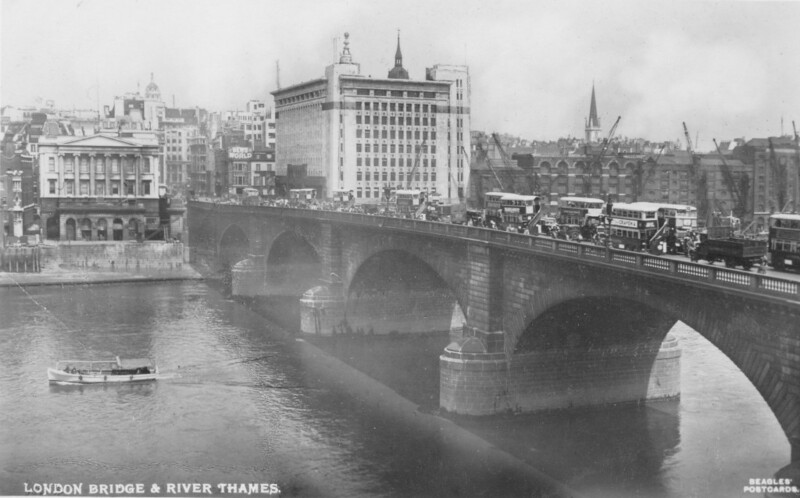 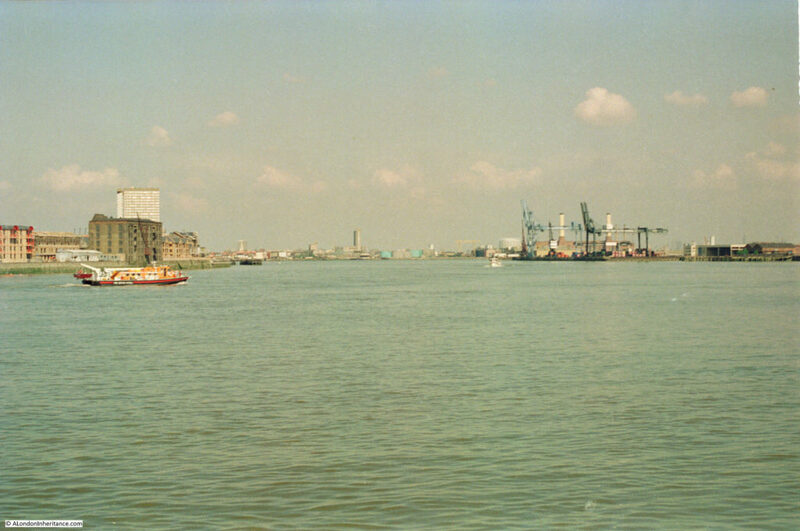 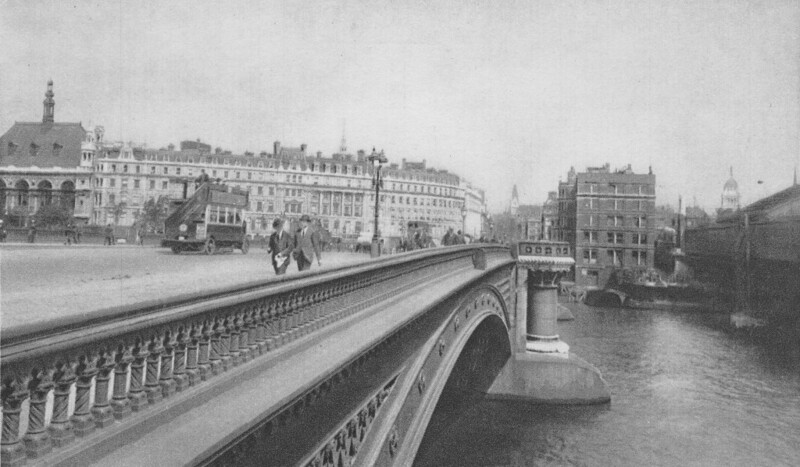 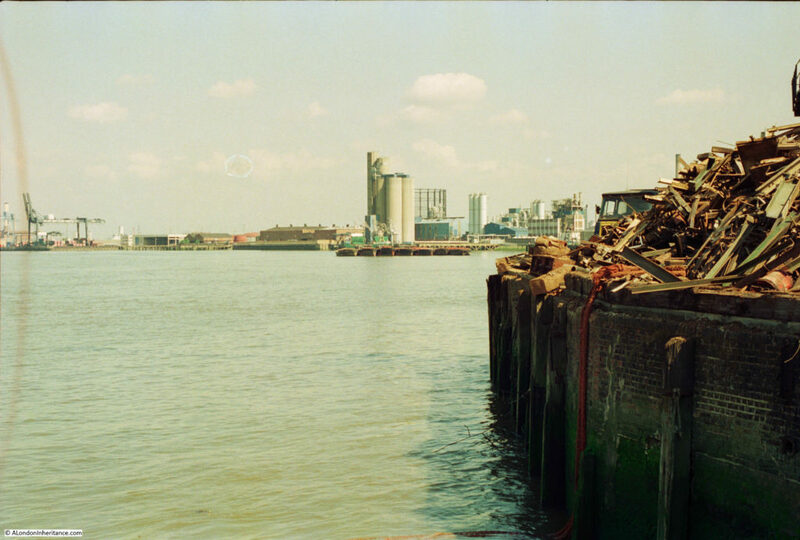 The following photo from 1986 shows a view across the full width of the River Thames. 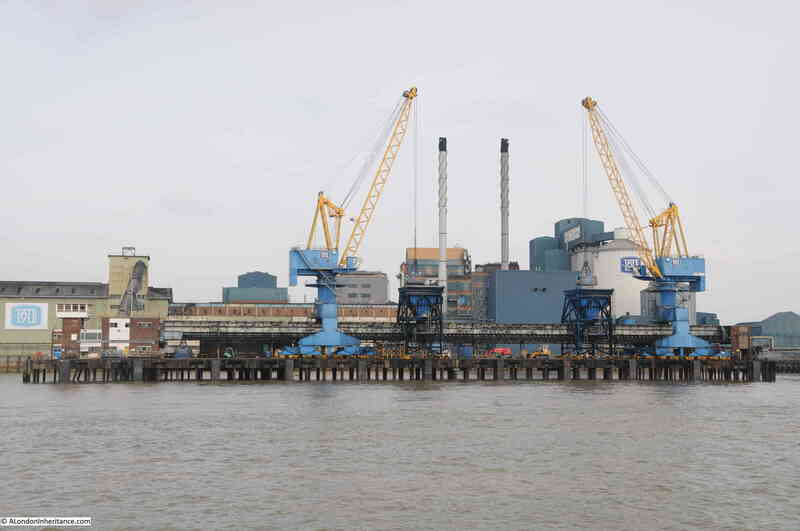 The large container cranes were part of the Victoria Deep Water Wharf. 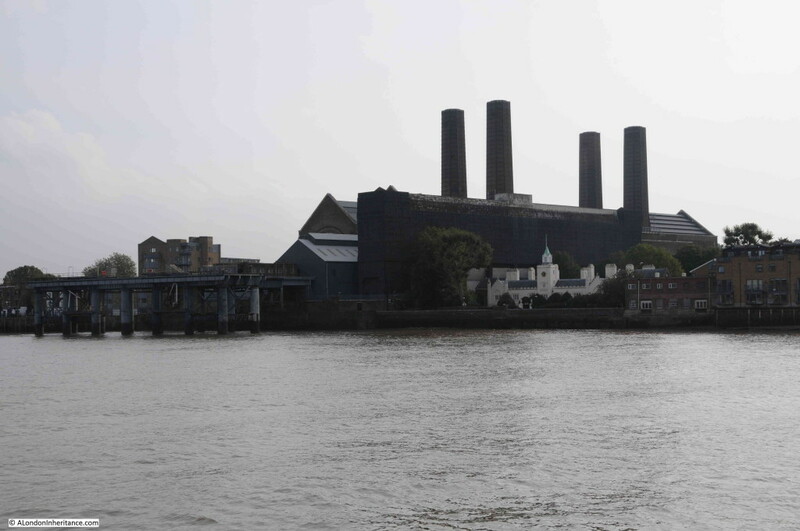 Behind these are two chimneys from the old Blackwall Power Station, commissioned in 1951 and closed thirty years later. 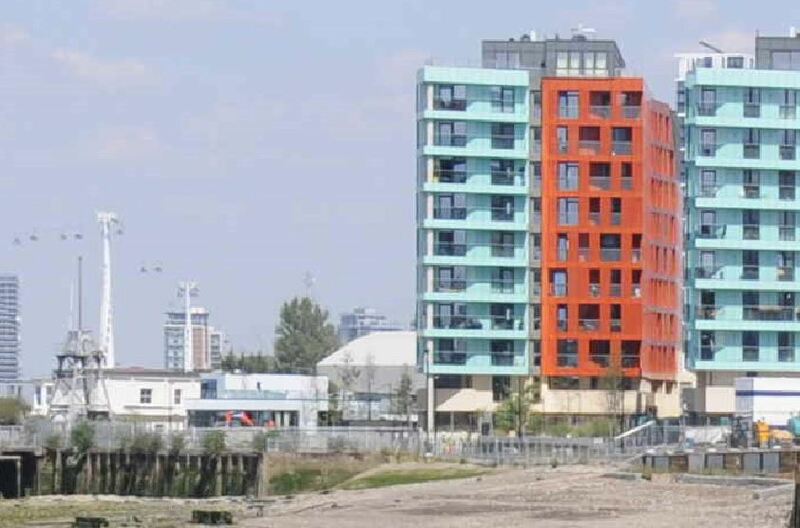 The only obvious surviving features are the old brick warehouse on the left (now flats) and the tower block behind. 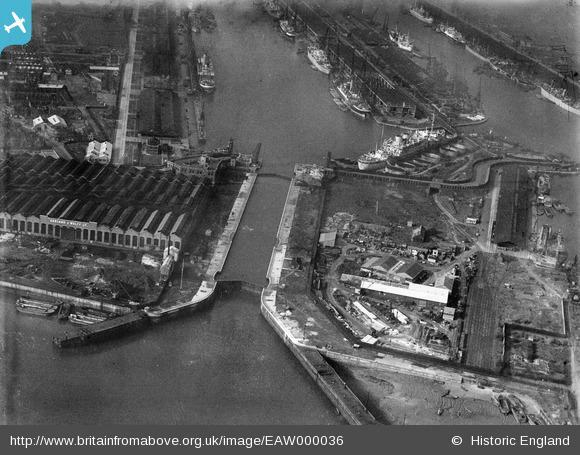 The following enlargement from one of my 2018 photos shows the same area today and whilst all the factory buildings have been demolished, the triangular metal structure, now painted grey, remains. This is part of the winding equipment that allowed undersea telecommunications cables manufactured in the buildings to the right in the 1986 photo to be transported from the factory onto ships moored in the river. 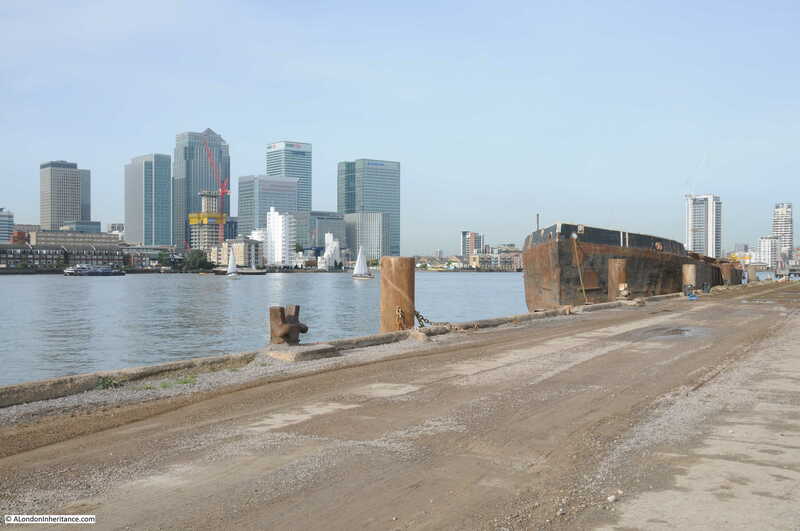 This is Enderby Wharf and is where the first cable to cross the Atlantic was manufactured with much of the world’s sub-sea communication cables being manufactured here until the mid 1970s. 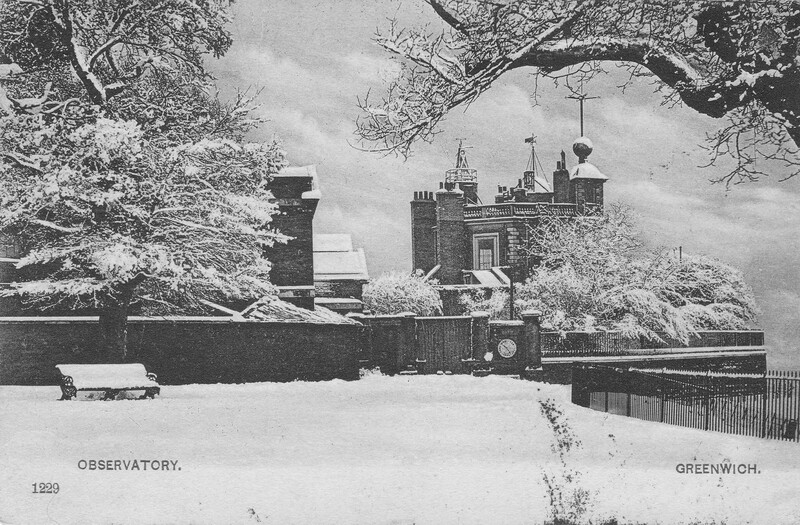 The white building behind is Enderby House, built around 1830 and the only remaining building from the factory site. 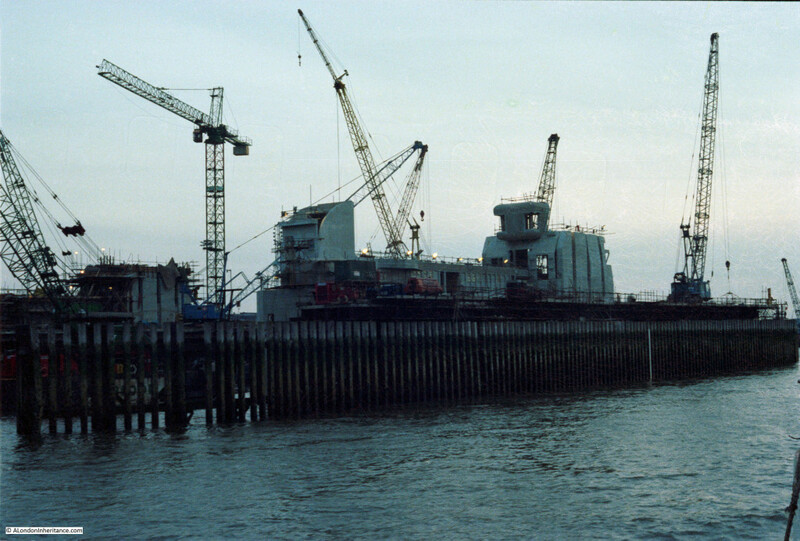 Enderby Wharf was the site for a planned cruise liner terminal, however these plans have been abandoned following local campaigns against the terminal as the lack of shore power would have meant ships moored at the terminal would be generating their own electricity and therefore polluting the local area. 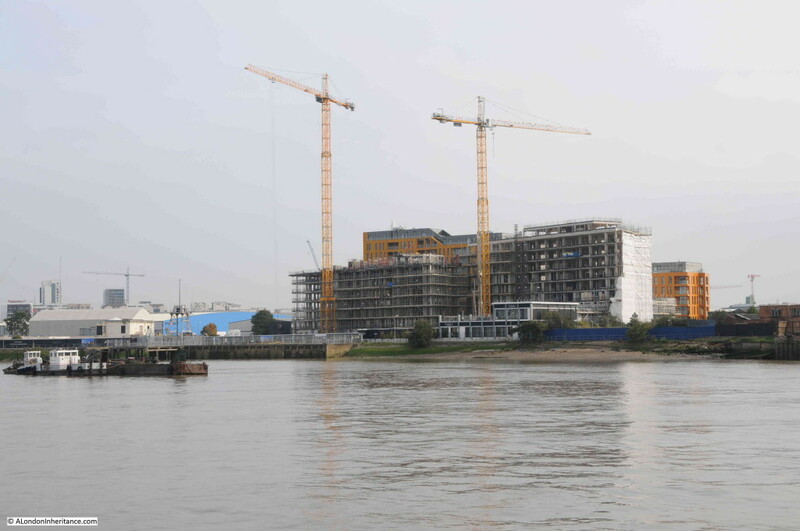 Although the cruise terminal has been abandoned, development of the Greenwich Peninsula continues and the river bank between the Cutty Sark pub and the O2 Dome will soon be an almost continuous line of flats. 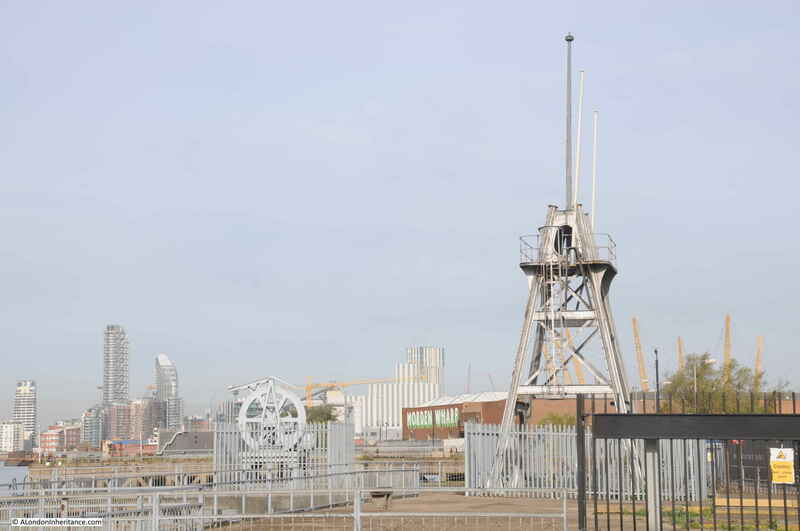 The industrial history of the Greenwich Peninsula is fascinating. 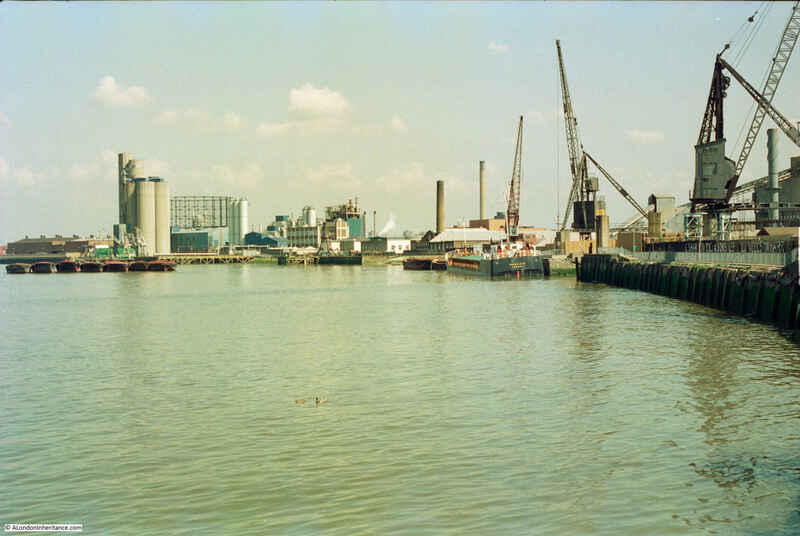 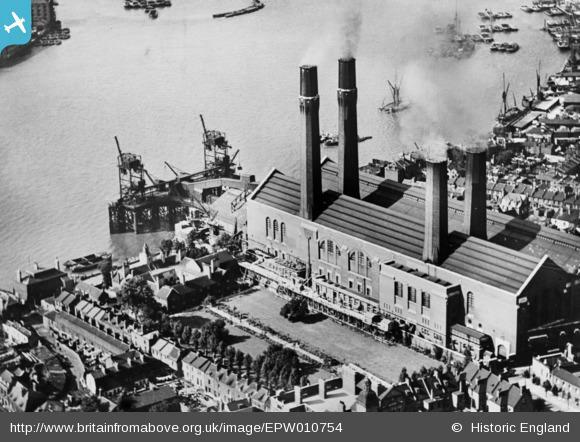 The book “Innovation, Enterprise and Change on the Greenwich Peninsula” by Mary Mills provides plenty of detail on the factories and industries that made their home on the peninsula. 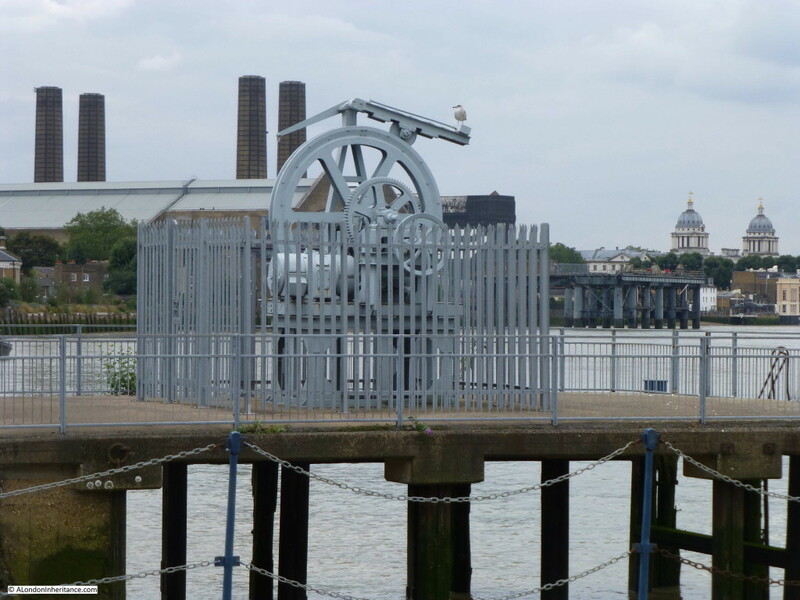 The Greenwich Industrial History site also has plenty of detailed information. 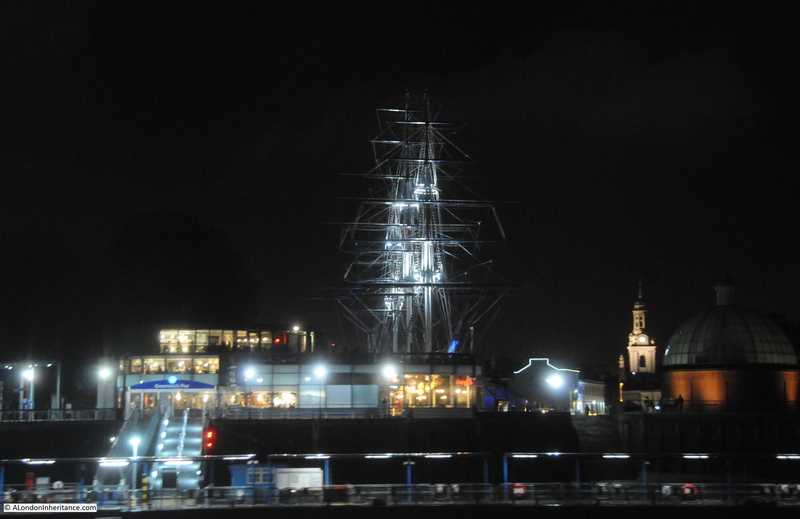 In the depths of January, I am just looking forward to when the weather improves and provides the opportunity to sit outside the Cutty Sark on a warm sunny day, with a beer and taking in the views of the river. 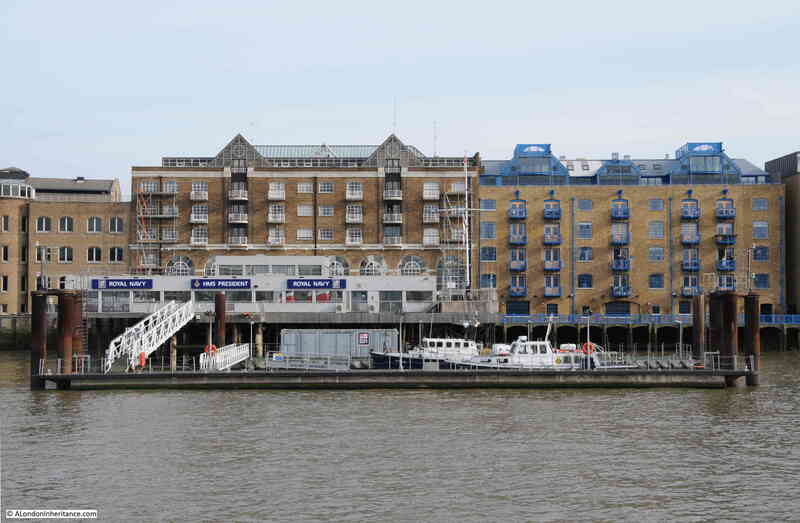 This entry was posted in London Pubs, The Thames and tagged Cutty Sark pub, Greenwich, Greenwich Peninsula on January 6, 2019 by admin. 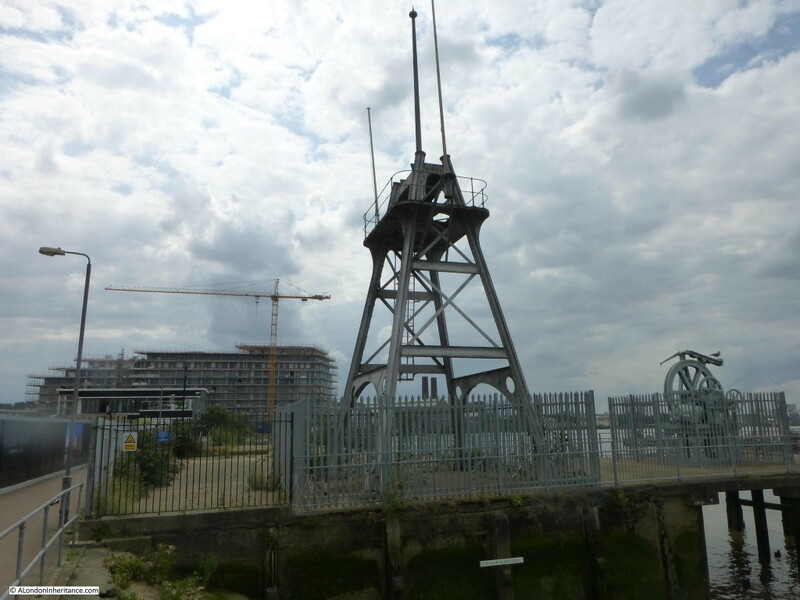 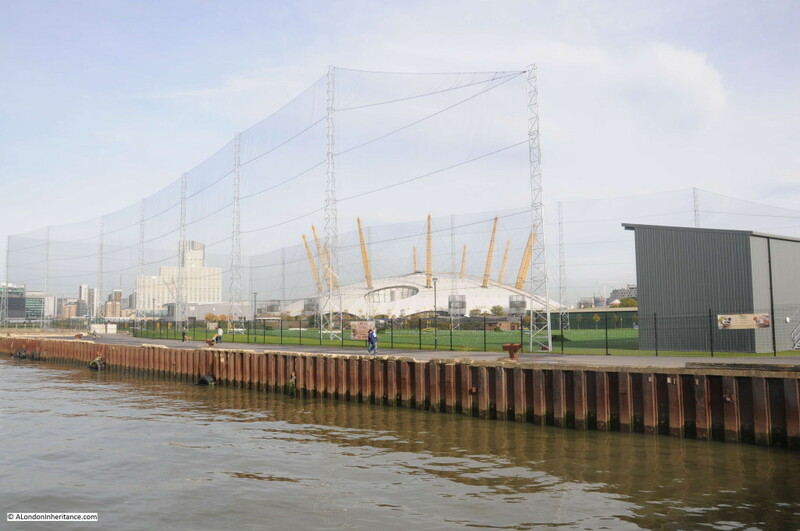 I have to blame a busy week at work for a different post this week to the one I had planned as I had hoped to visit a couple of locations for some research, so for this week’s post I would like to take you on a walk along the Greenwich Peninsula. 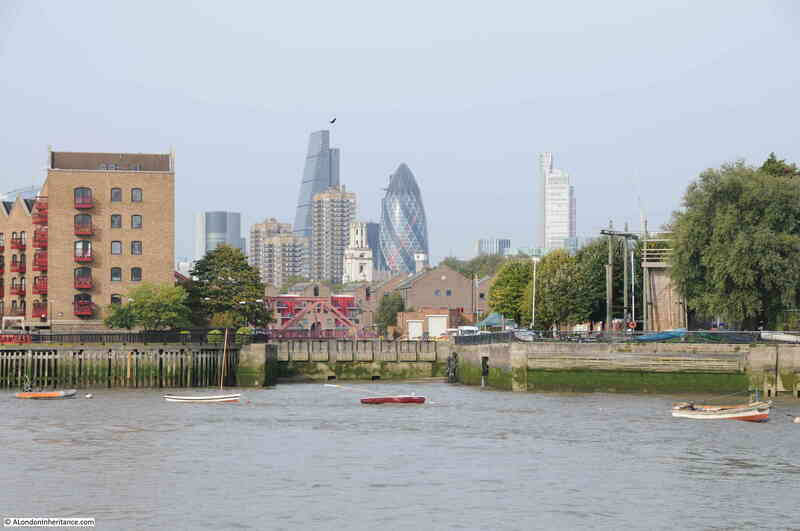 It is rather brief, but does cover a fascinating part of London and one that is to see some significant change over the next few years. 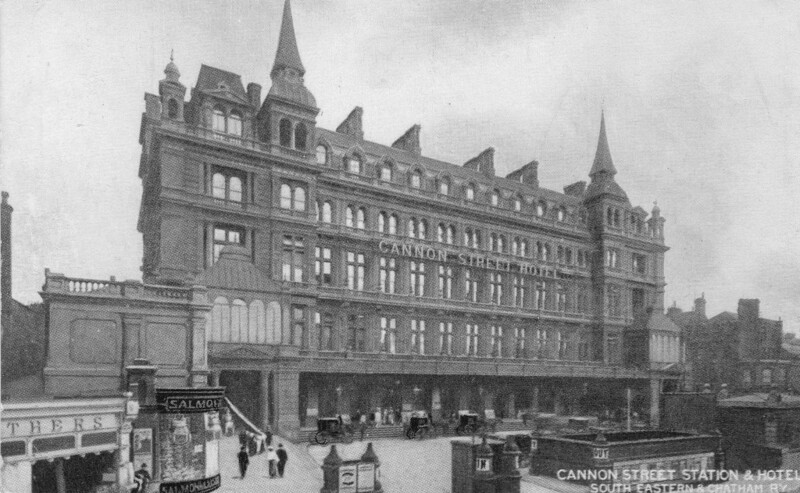 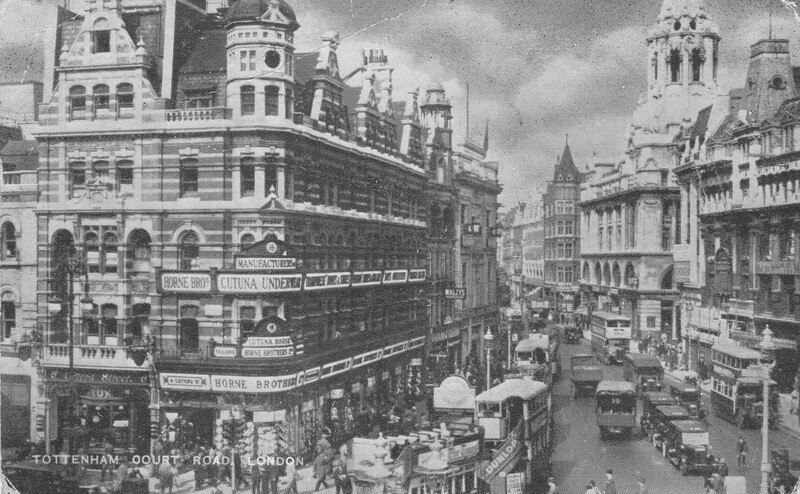 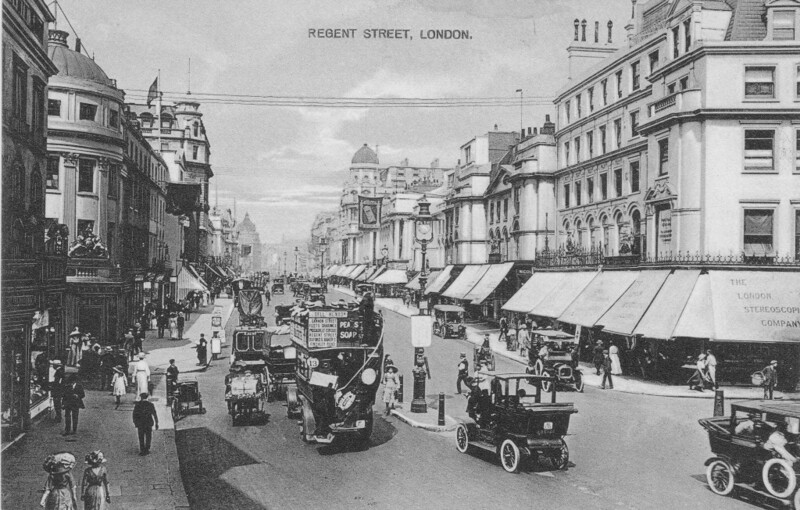 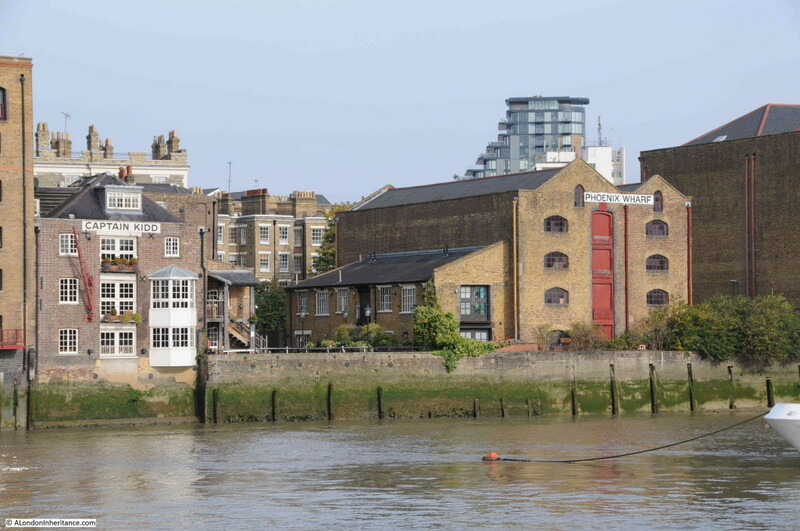 London is changing so rapidly that it is difficult to photograph places and buildings before they change or disappear and the subject of this week’s post is an area I wish I had photographed before, I have walked the area but did not photograph, so this is very much a catch-up. 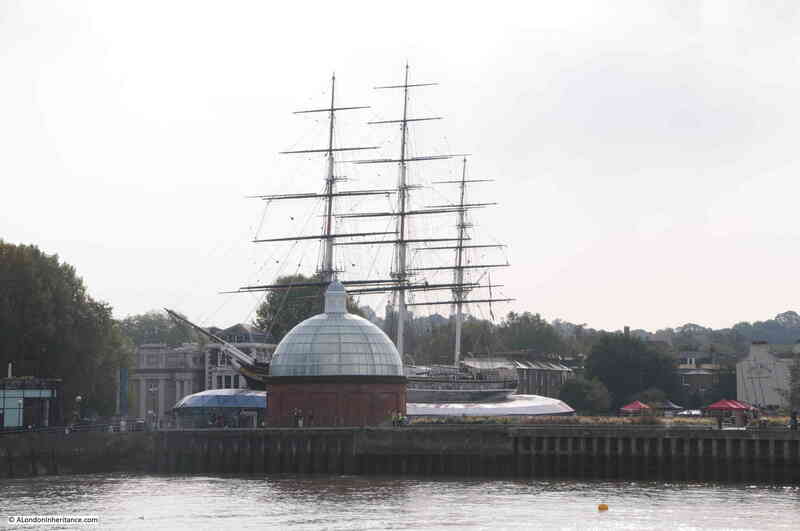 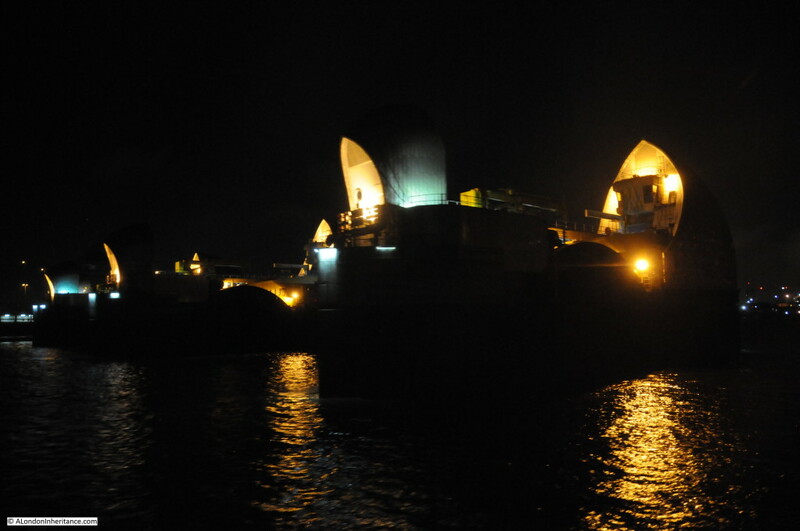 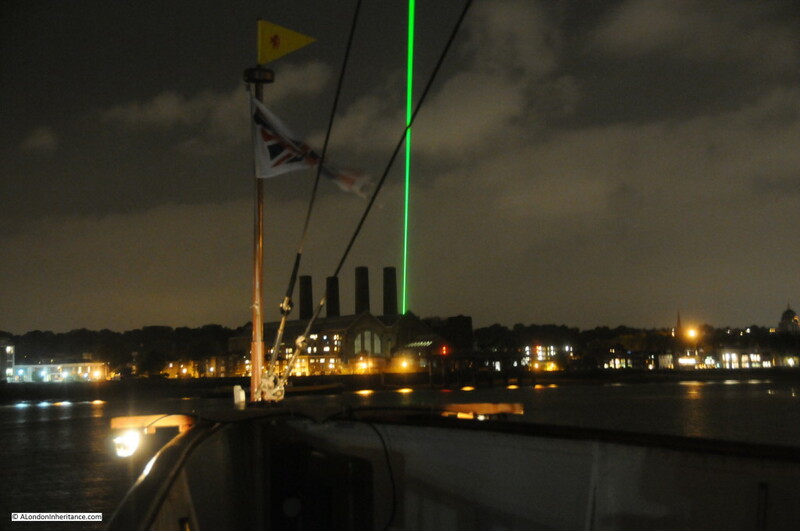 Greenwich is mainly known for the Royal Observatory, the National Maritime Museum, Cutty Sark etc. 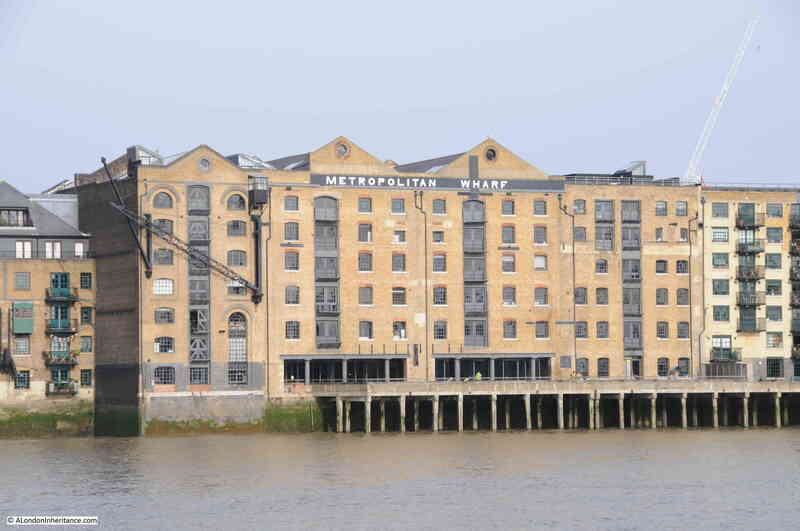 however step a short distance away from these places and there are the remains of an industrial landscape that will soon be covered in the ubiquitous apartment buildings that can be seen across London, all basically to the same design and of the same materials. 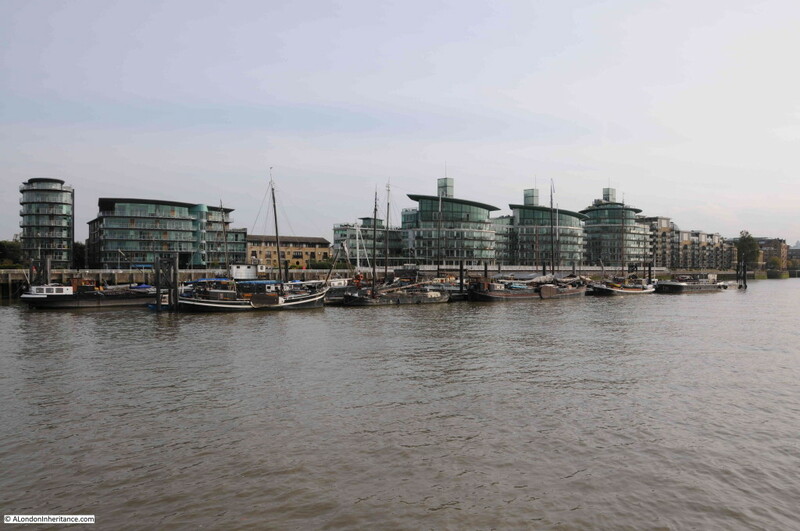 As well as the apartment buildings, this area is also planned to be the site of a cruise ship terminal in the next few years, providing visitors with access to both Greenwich and central London. 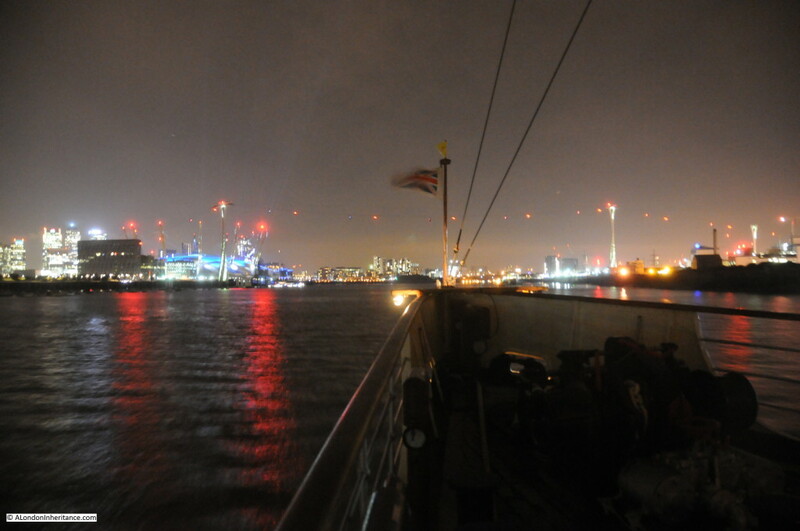 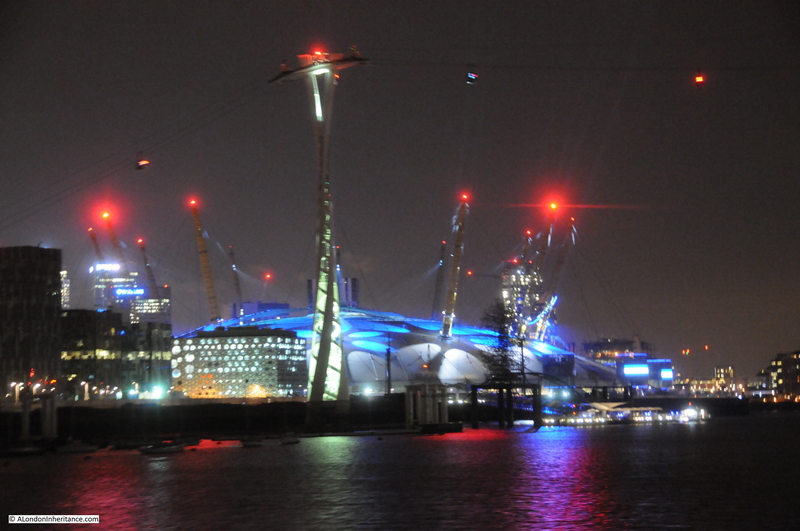 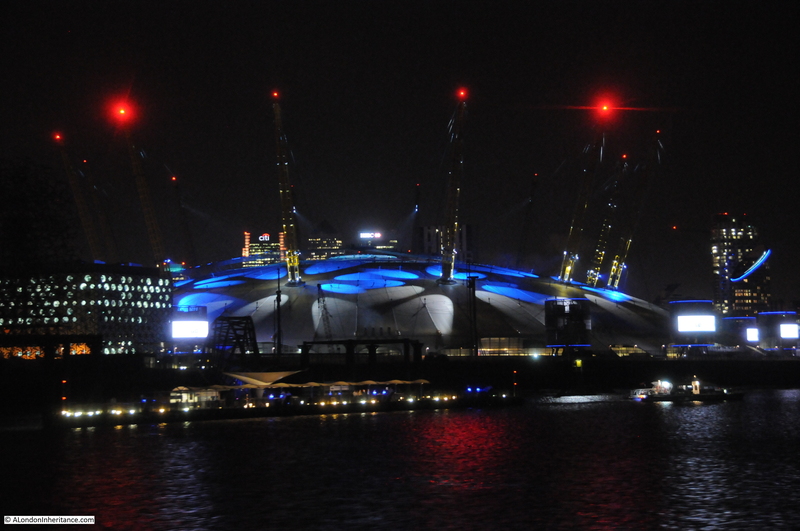 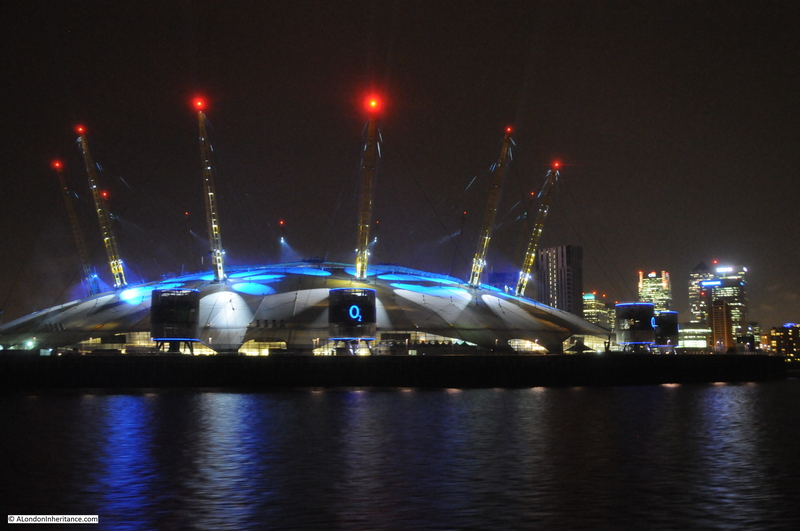 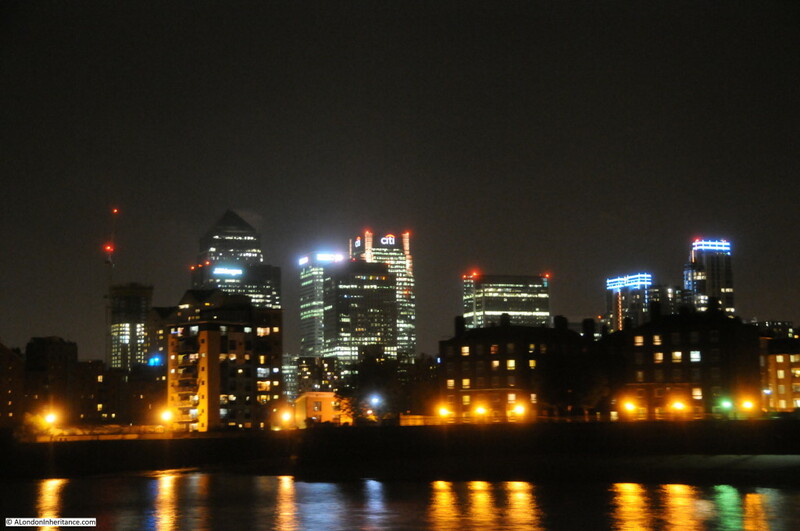 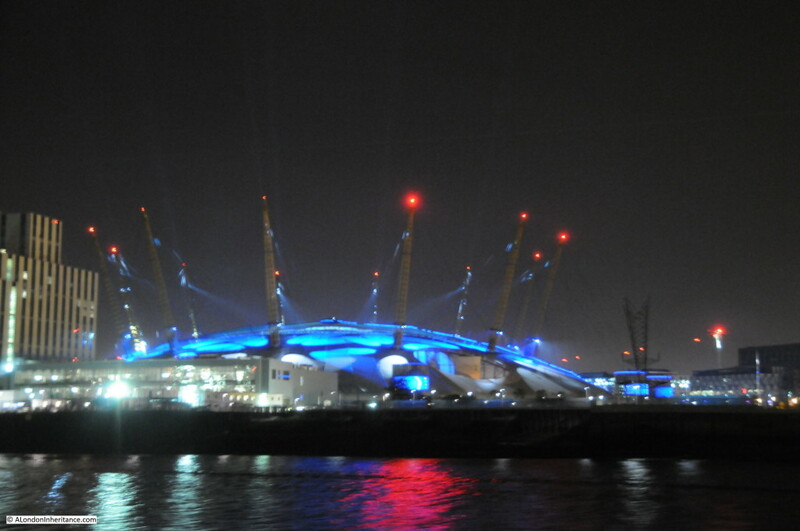 The photos below come from a couple of last year’s walks from Greenwich to the O2 Dome. The area has a fascinating industrial history and for a very well researched book about the area I can highly recommend the book Innovation, Enterprise and Change on the Greenwich Peninsula by Mary Mills. 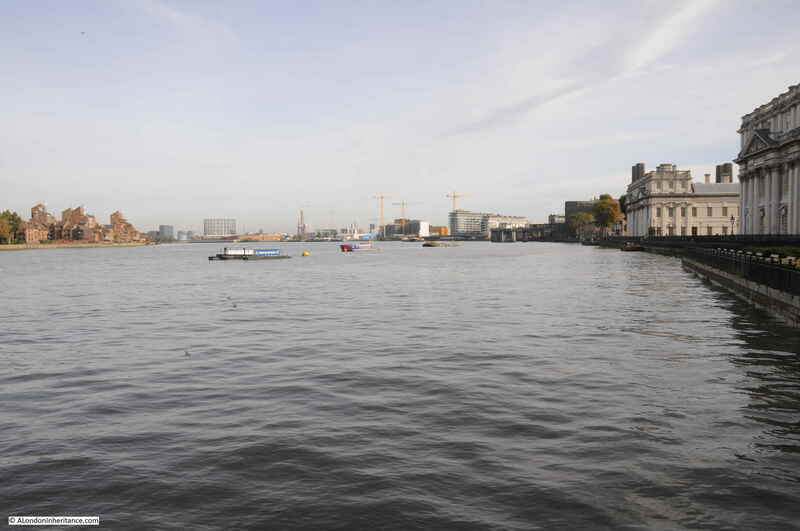 Starting from the Greenwich Pier, the view along the river gives an indication of what is to come with cranes in the distance towering above new construction work. 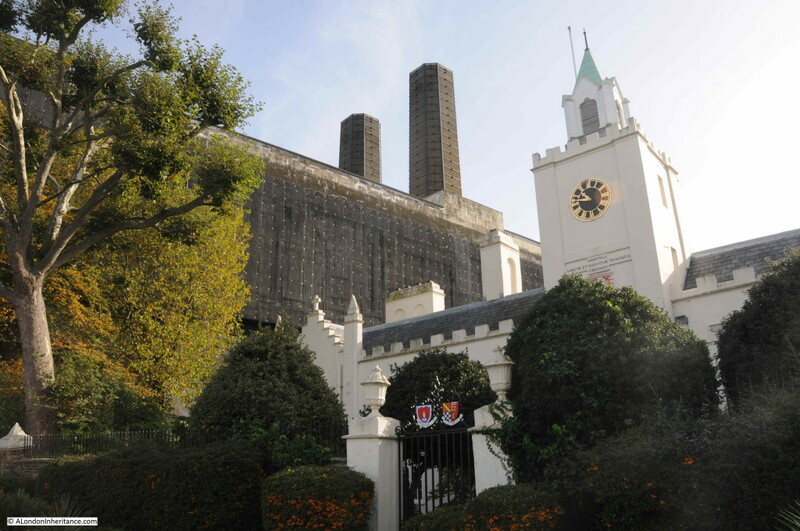 Walking along the river path having passed the buildings of the Old Royal Naval College and along a side road, is the Trinity Hospital and Greenwich Power Station. 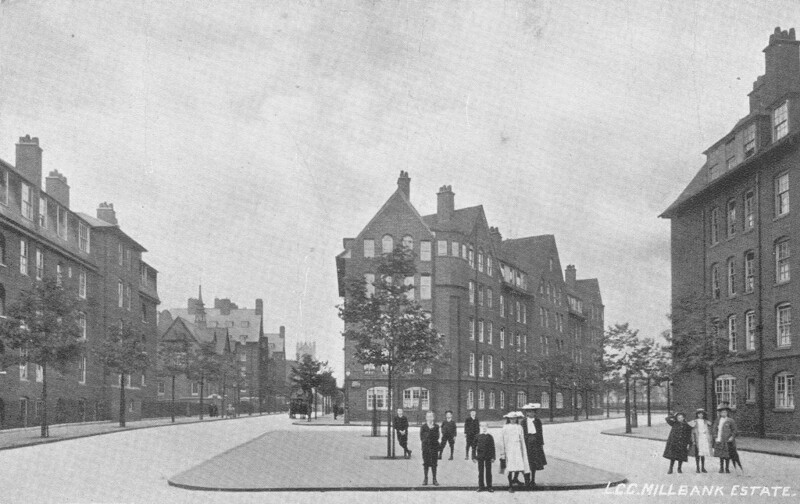 The Almshouses of Trinity Hospital have been on the site since the 17th century, but the current buildings are from the early 19th century. The adjacent power station was built at the start of the 20th century to power the London tram and underground network, however since the transfer of the power supply for the underground to the National Grid, the Greenwich Power Station retains a role as a backup generator. 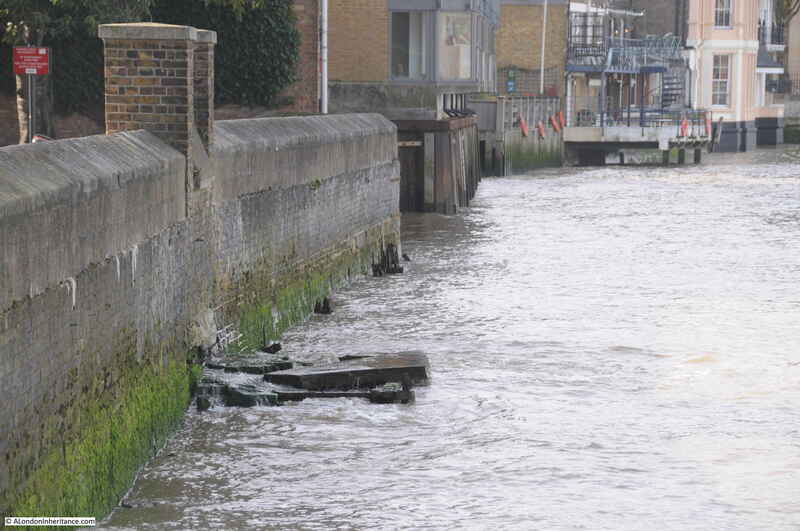 The river wall in front of the Almshouses records past levels of flooding. 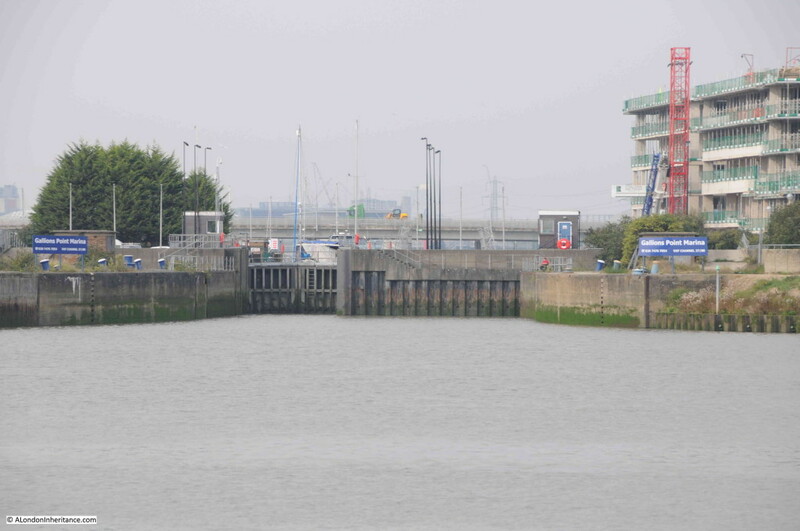 The lower left plaque records the height of the tide on the 30th March 1874. 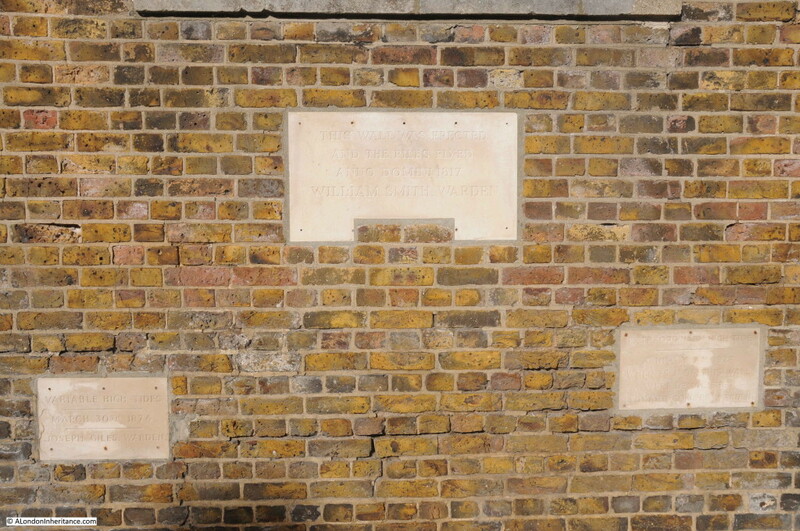 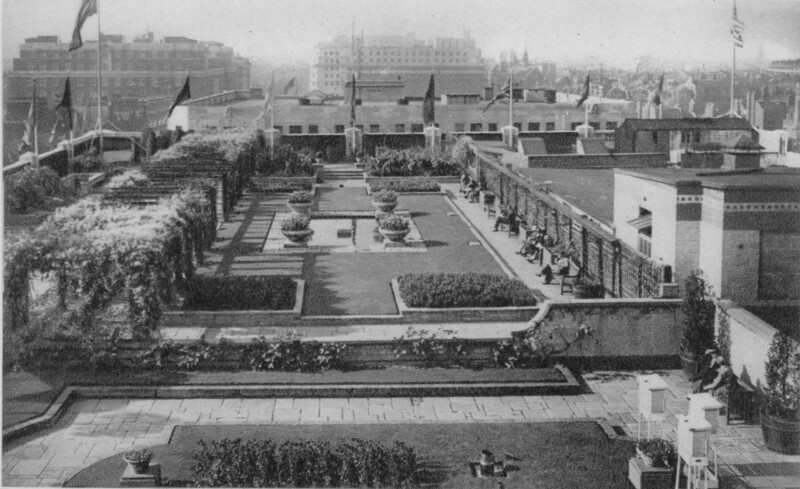 The plaque on the right records “an extraordinary high tide” on January 7th 1928 when “75ft of this wall were demolished”. 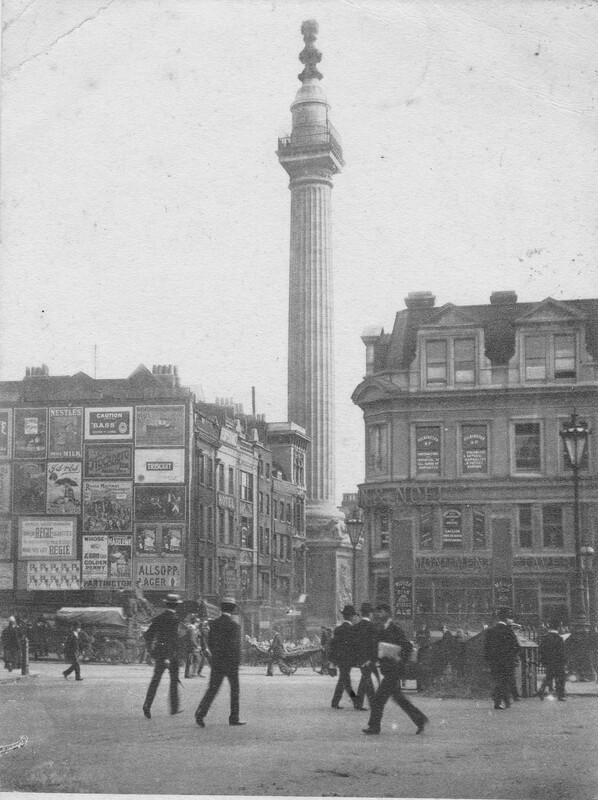 The plaque at the top records that the wall was “erected and the piles fixed” in the year 1817. 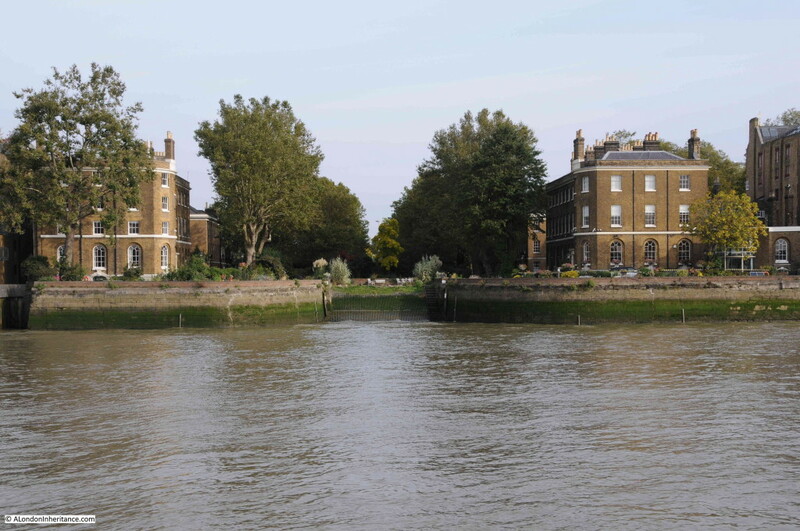 Walk along a bit further and it is possible to look back to the river wall in front of the Almshouses and see the remains of the original steps that led up from the river. 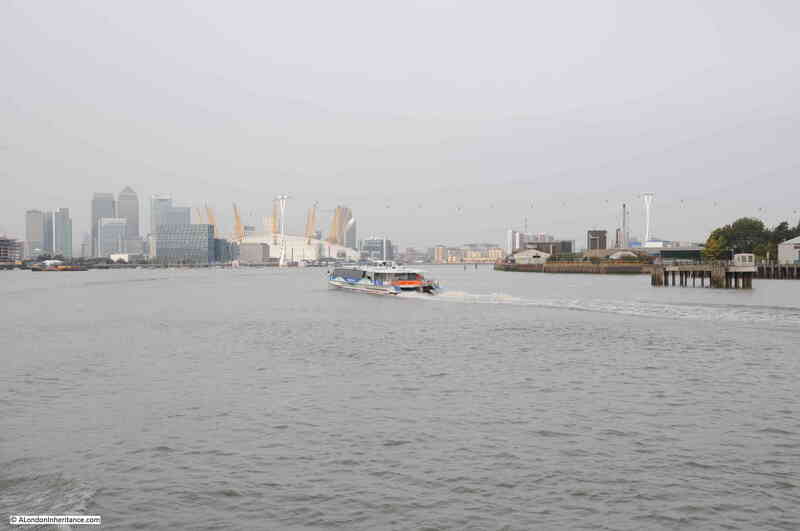 A reminder of when the majority of travel to sites along the river would have been on the river. 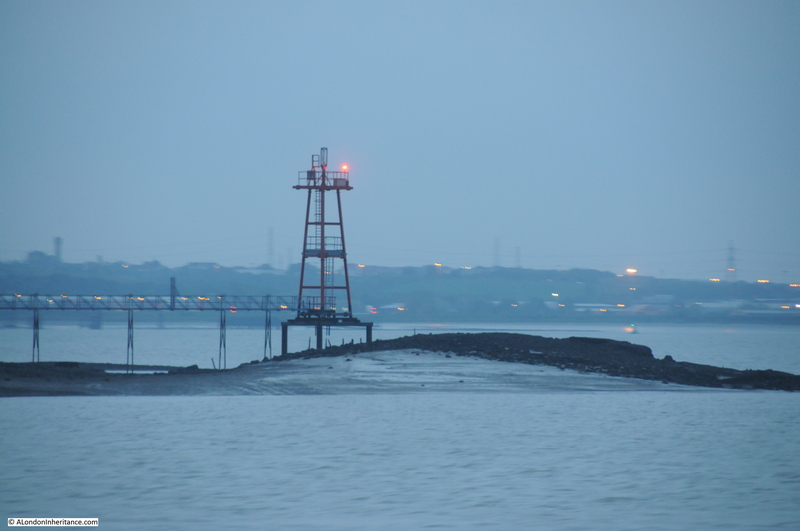 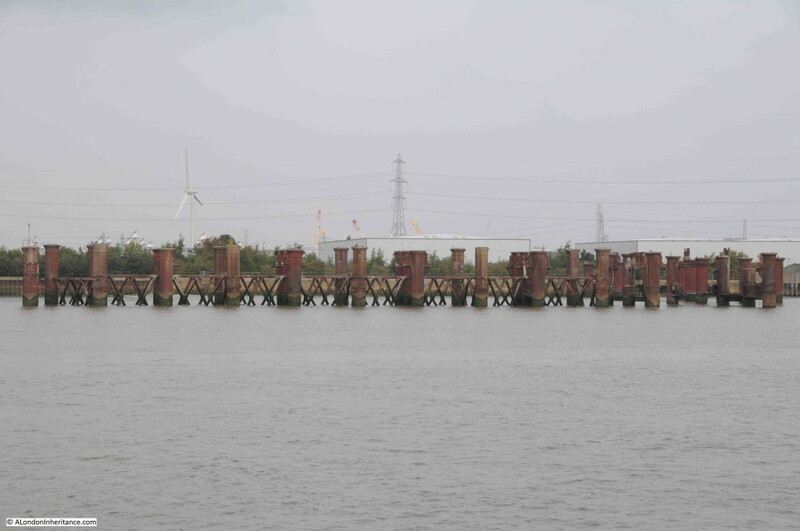 The original coal supplies for the power station came by river and the jetty remains, now unused as the limited amount of oil and gas needed for the power station in a standby role is delivered by road. 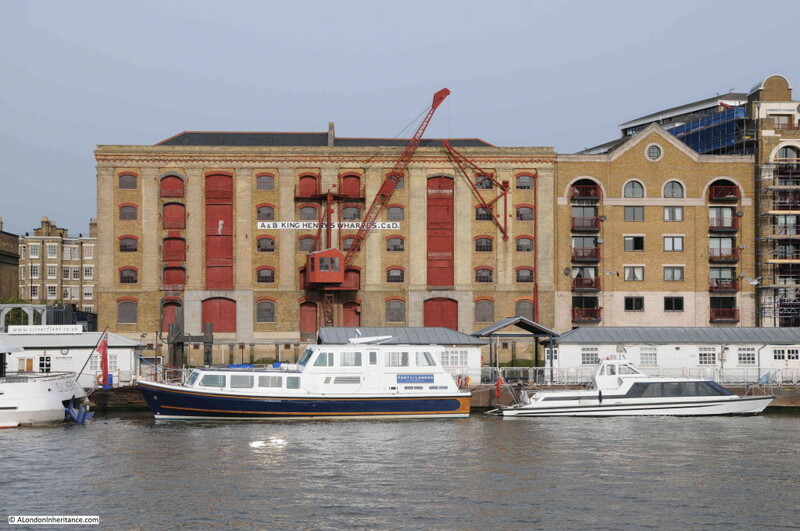 Walk past the power station and the Cutty Sark pub (a good stop before setting off towards the Dome) and the building marked as the Harbour Masters Office is the last building before we come to what was the old industrial area and is now the subject of much redevelopment. 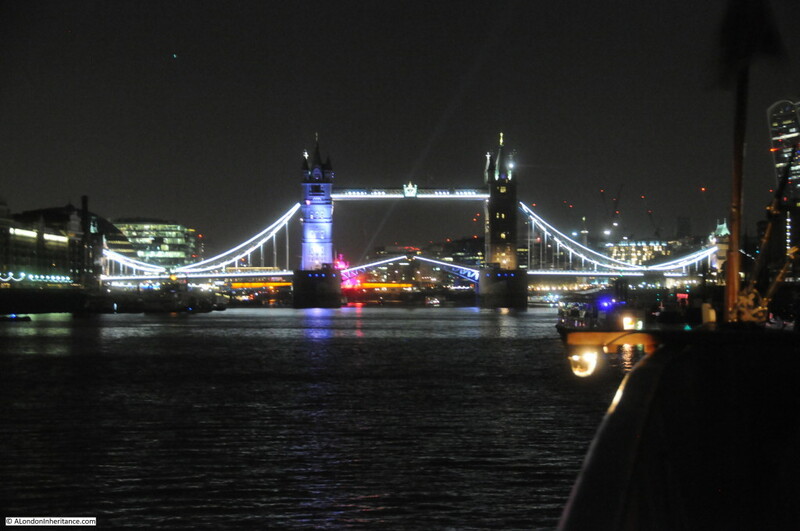 Walk up a short ramp and this is the view. 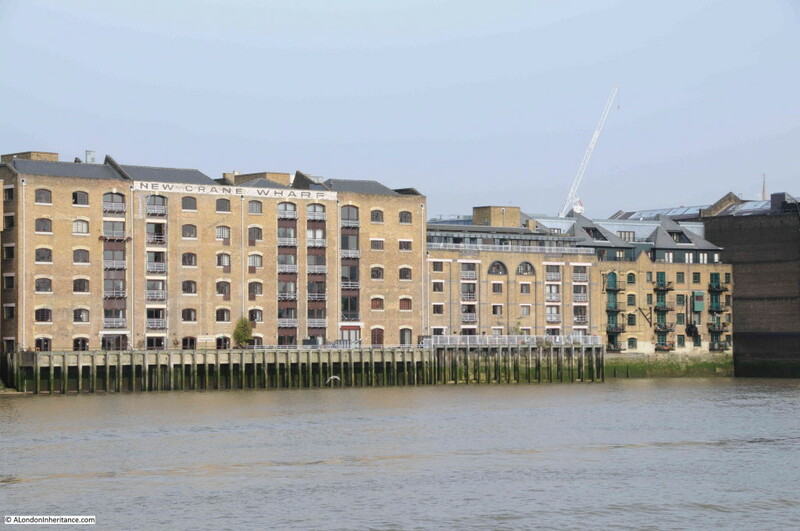 Whilst there is an urgent need for lots more housing in London, why do all apartment buildings have to look identical and obliterate any local character. 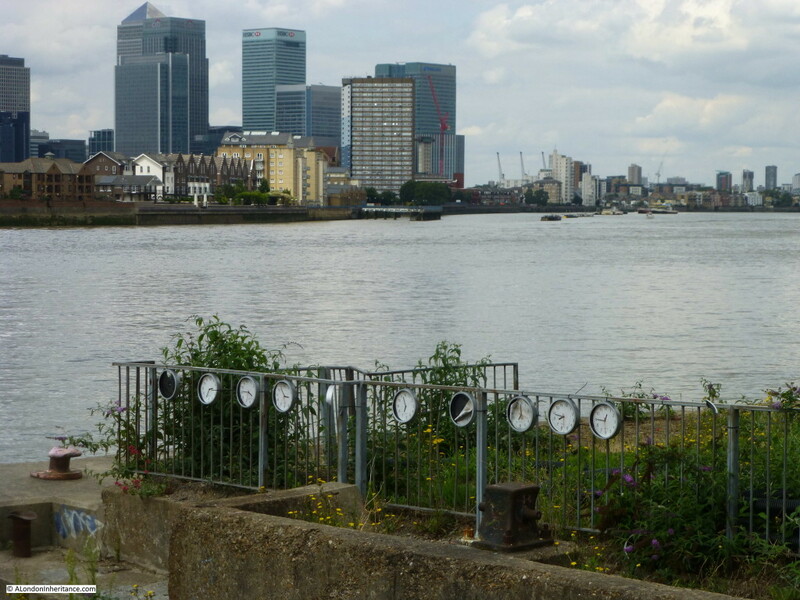 There are the remains of a number of artworks along this stretch of the Thames. Here a line of clocks tied to fencing. 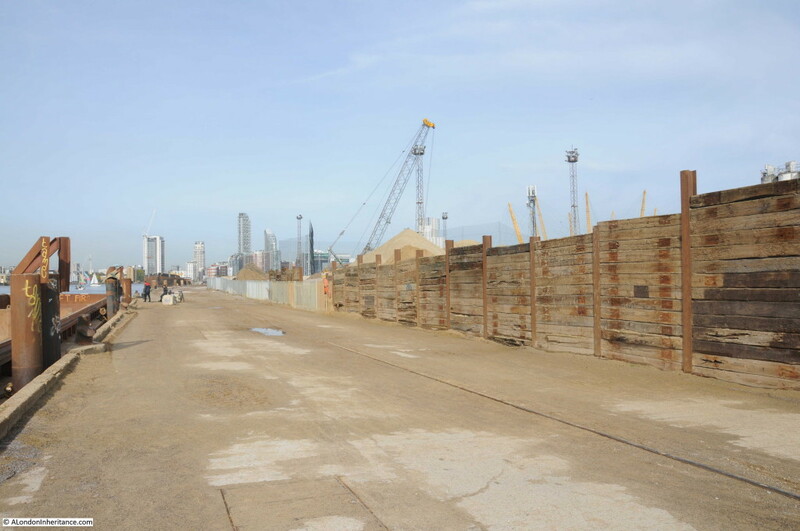 Some parts of the walk are between fenced off industrial areas waiting for development. Indeed walking along the path you do get the feeling that the area is just waiting – the industry has gone, the new development has not yet started. 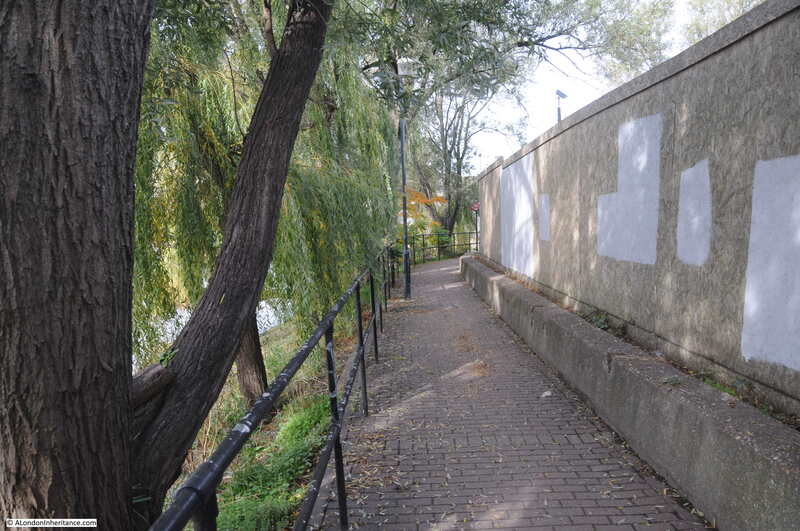 Where the pathway runs along the river there are a surprising number of trees. 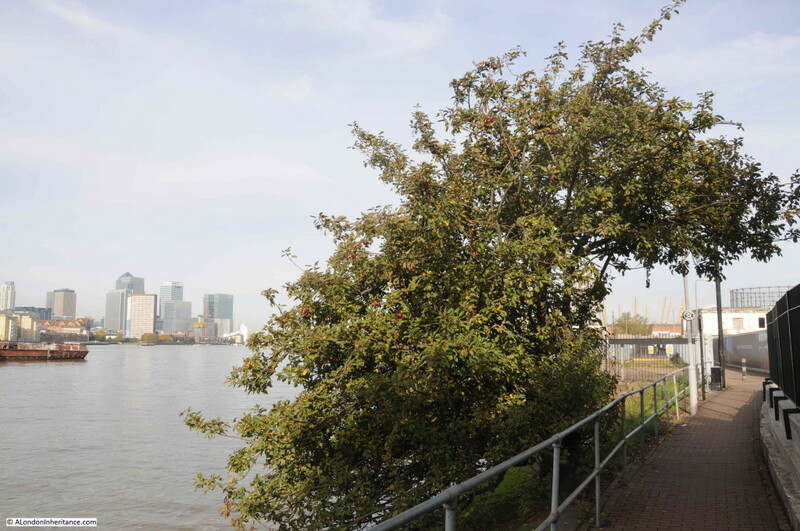 Here an apple tree, intriguing to think that this could have grown from the seeds in an apple core thrown down by a long departed worked, or possibly washed down the Thames. 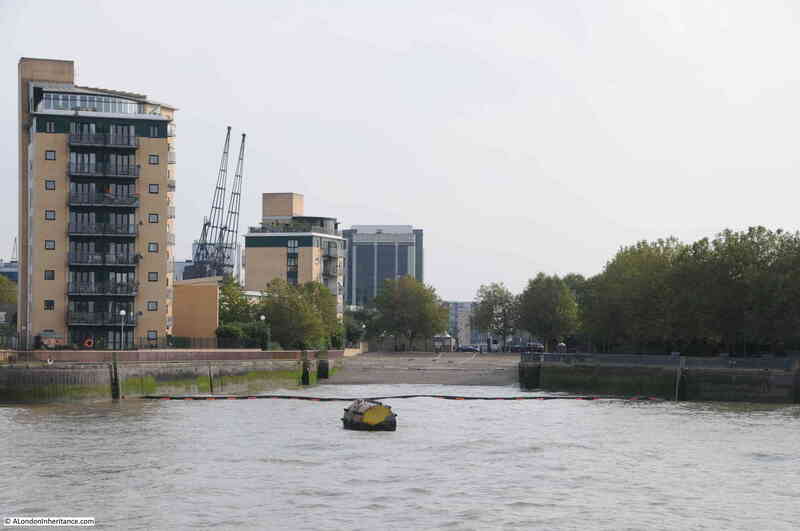 One of the main industries along this stretch of the river was the manufacture of submarine communication cables which took place at Enderby Wharf and it is here that we can see the remains of some of this activity. 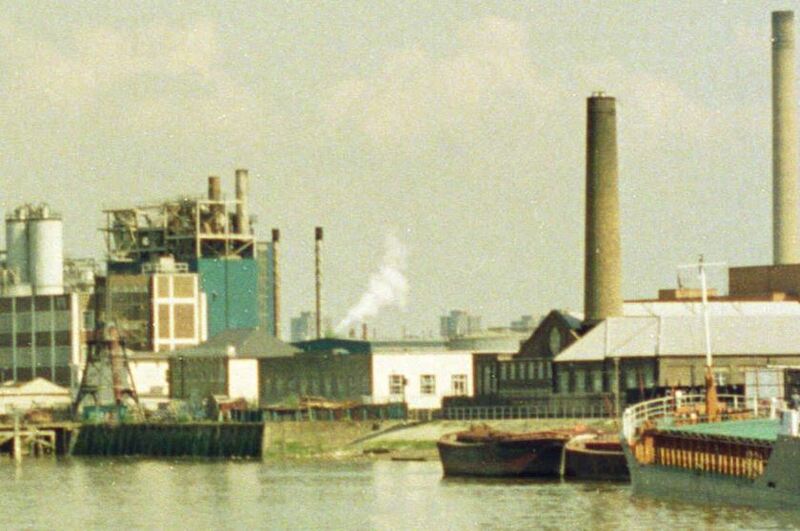 Here was manufactured the first cable to cross the Atlantic and up until the mid 1970s much of the world’s subsea communication cables had been manufactured here. 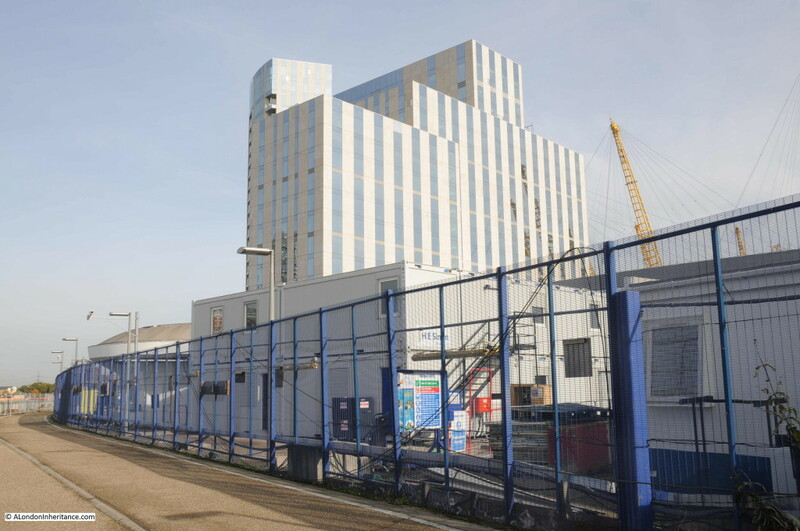 The web site covering the history of the Atlantic Cable and Undersea Communications has a detailed history of Enderby Wharf. 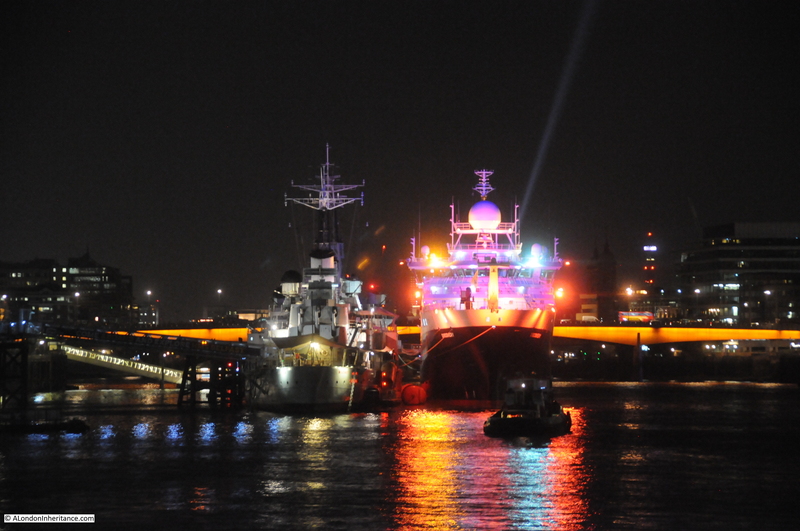 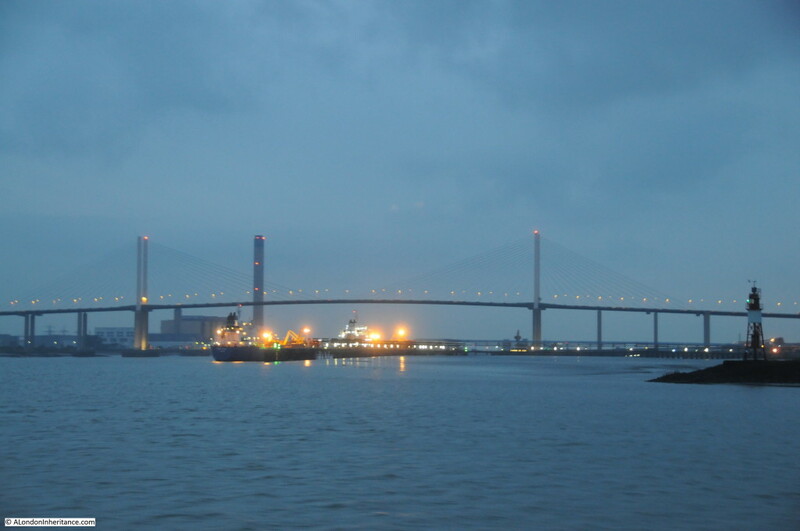 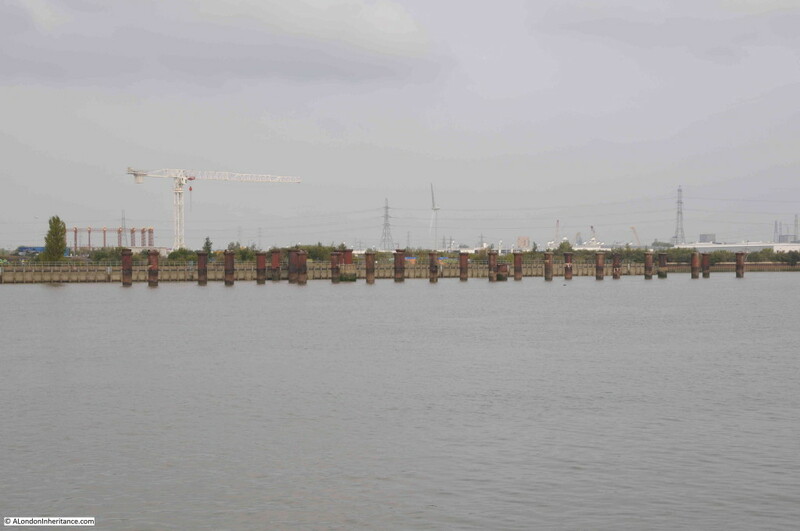 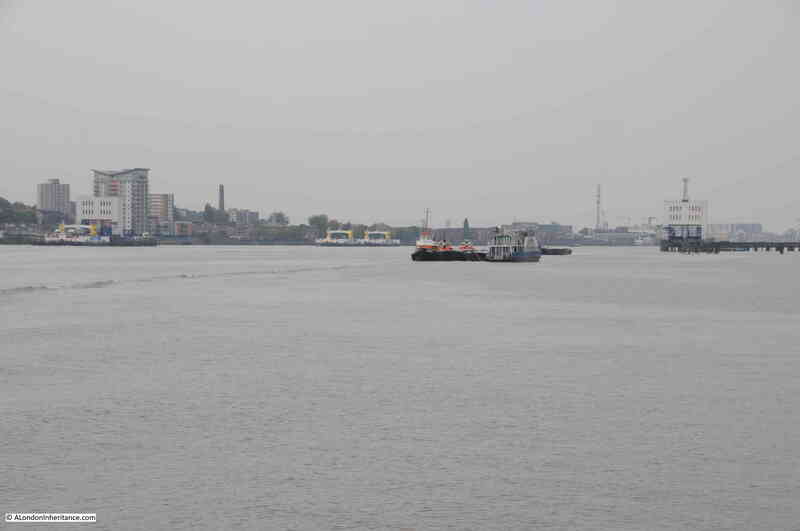 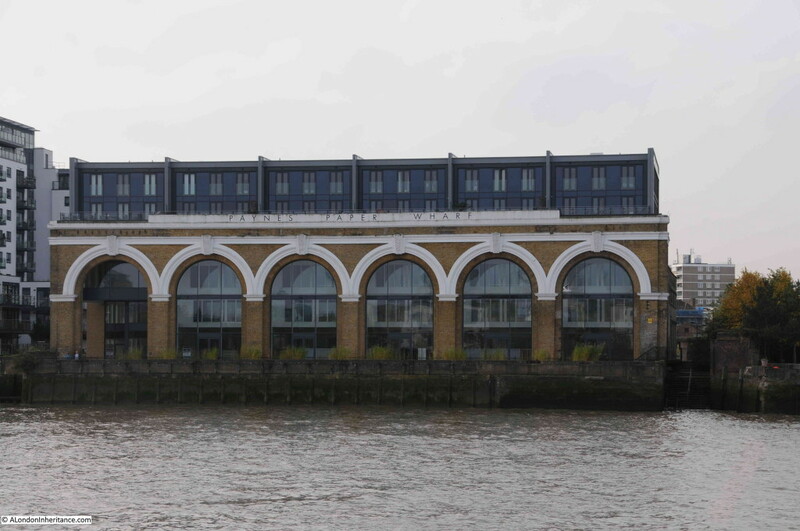 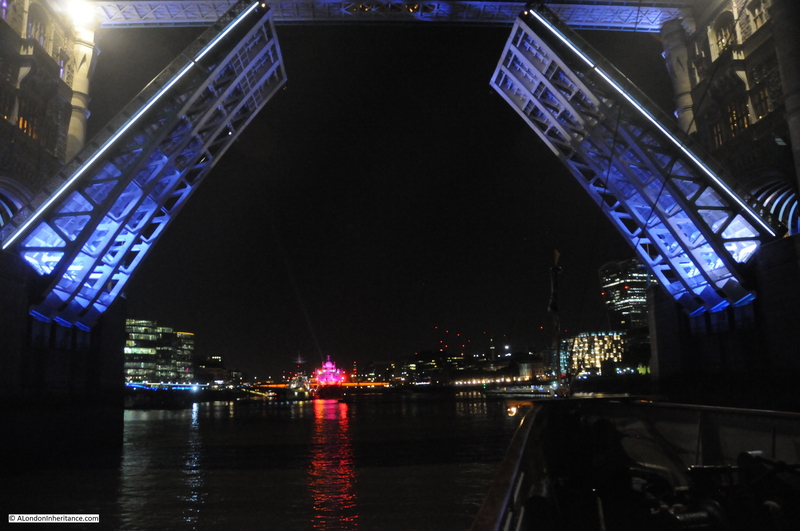 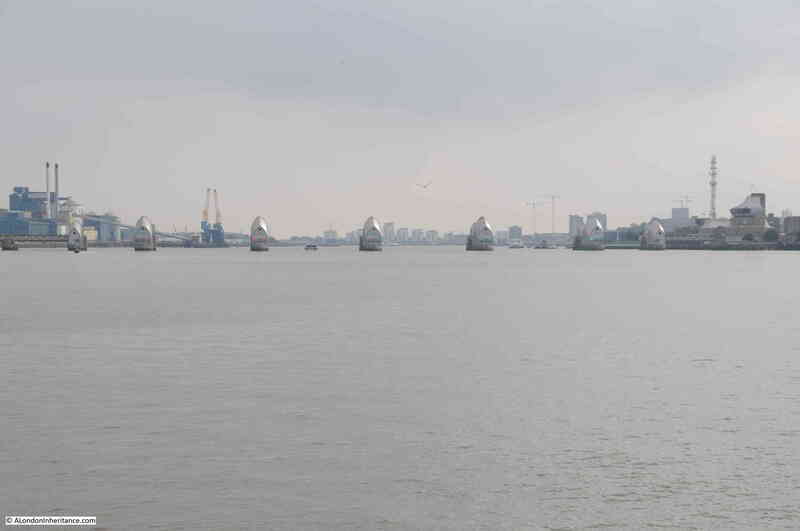 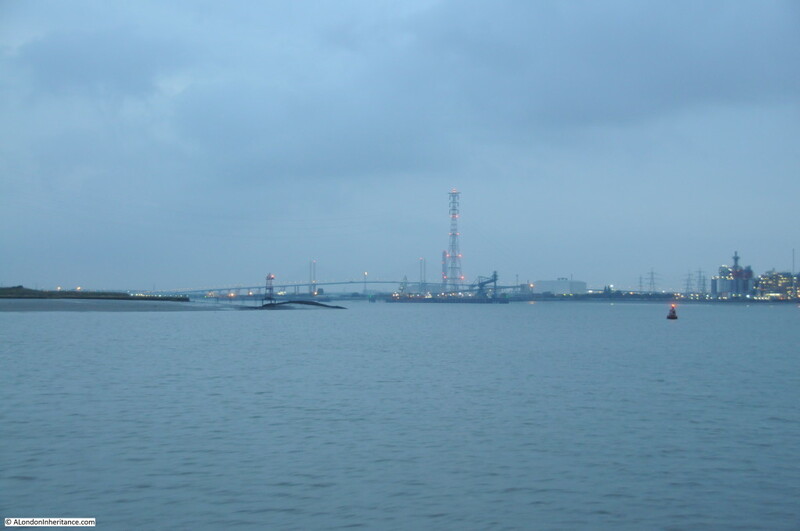 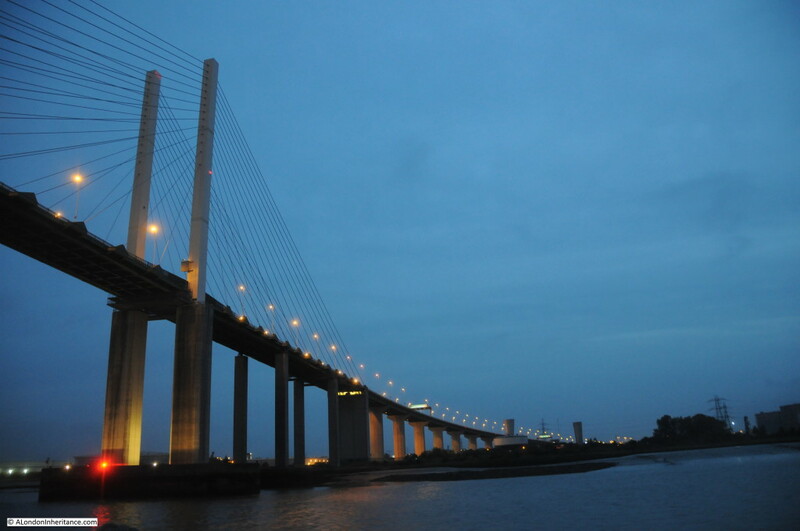 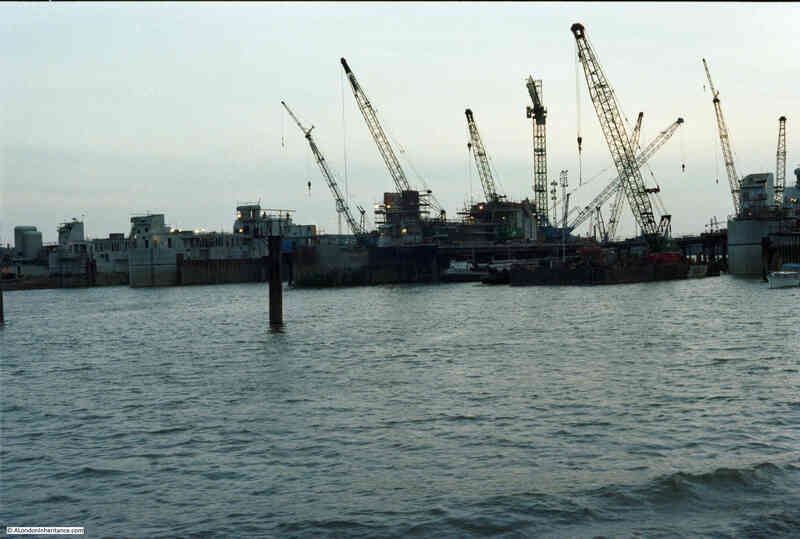 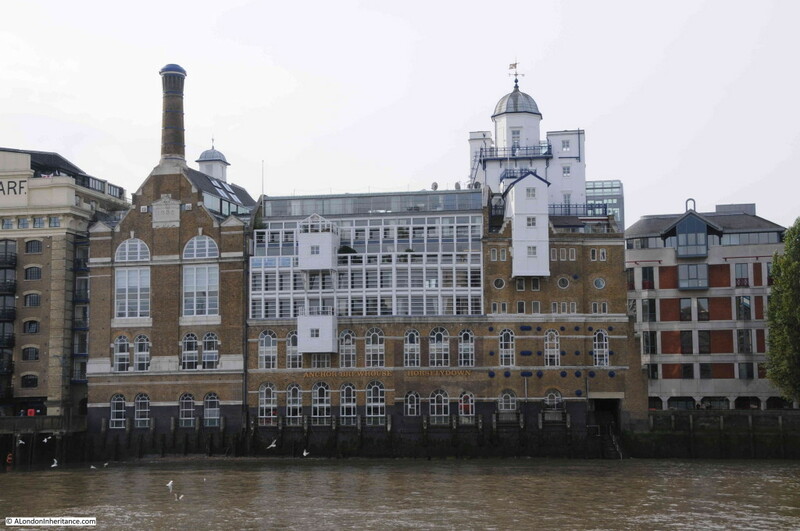 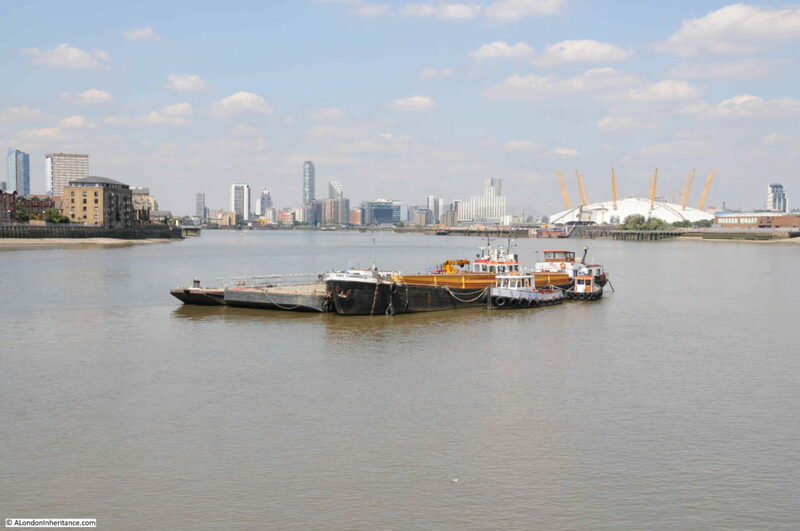 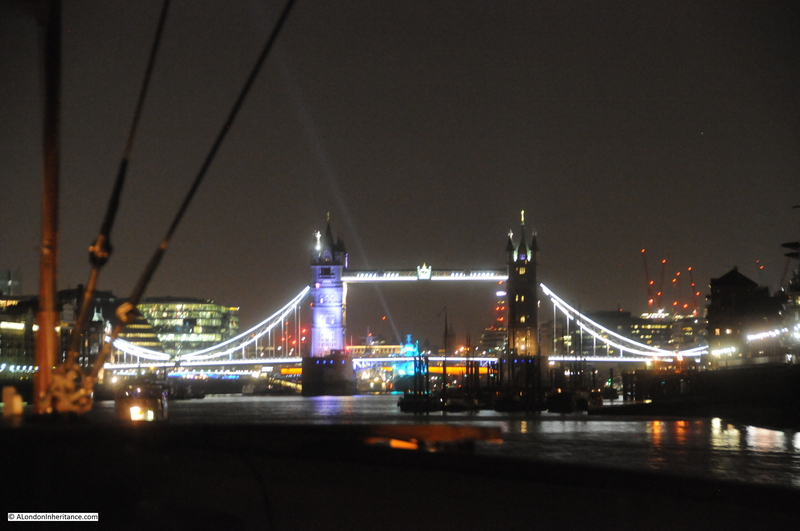 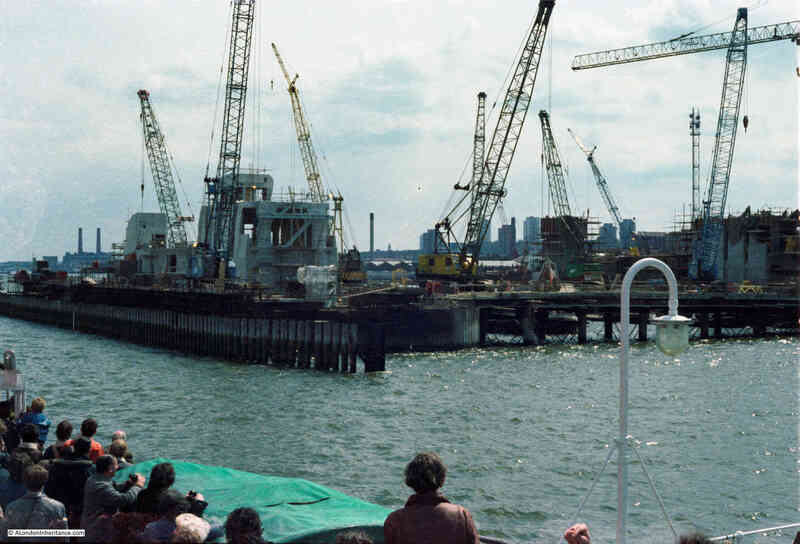 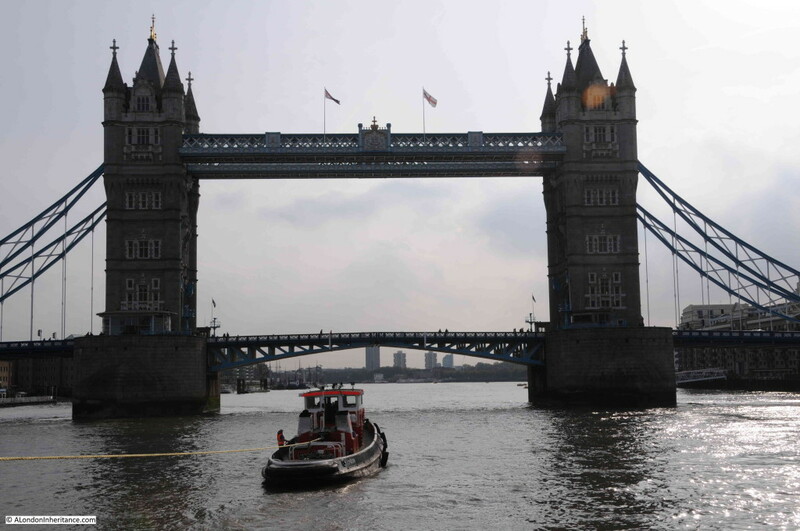 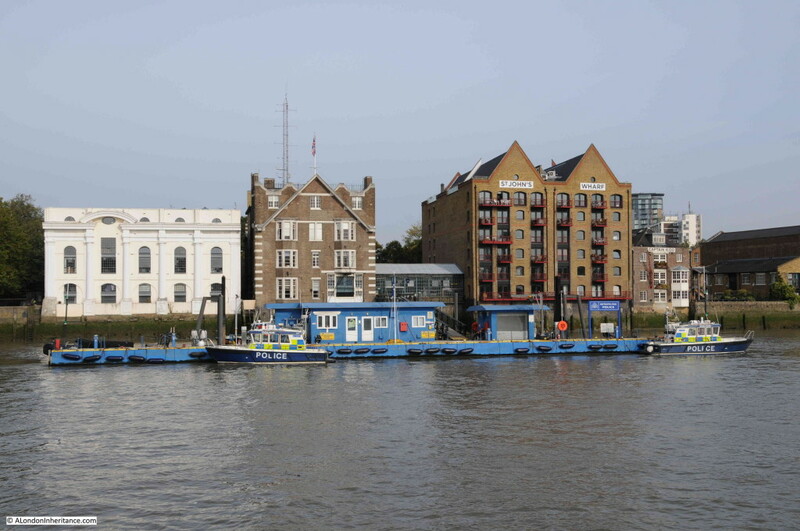 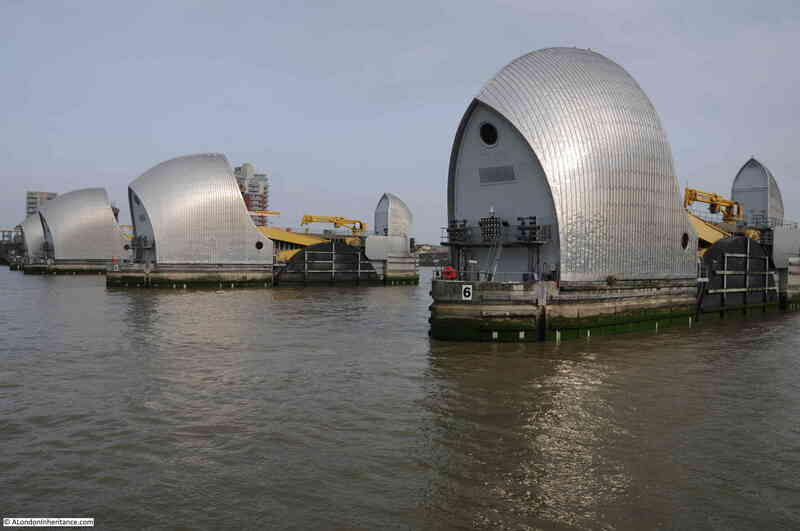 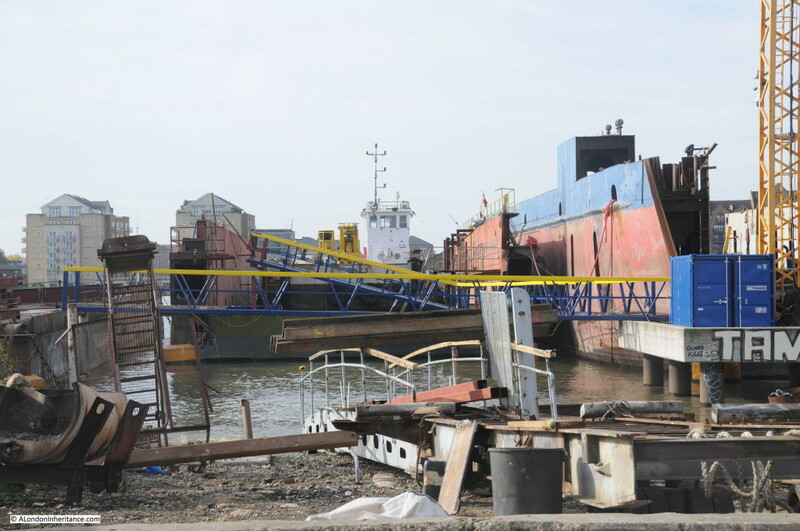 The two structures that can still be seen are part of the mechanism for transferring cable from the factory on the right to cable ships moored in the Thames to the left. 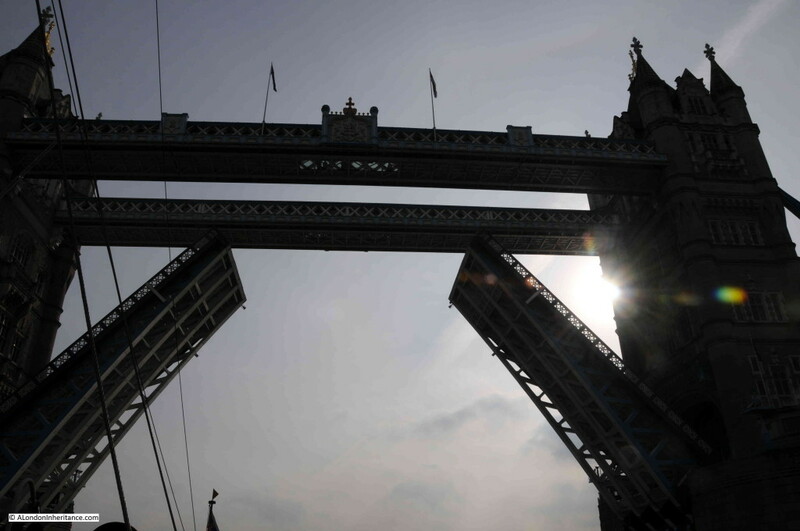 Cable would be run across the walkway to the top of the tower on the right then to the round hold-back mechanism on the left then onto the ship. 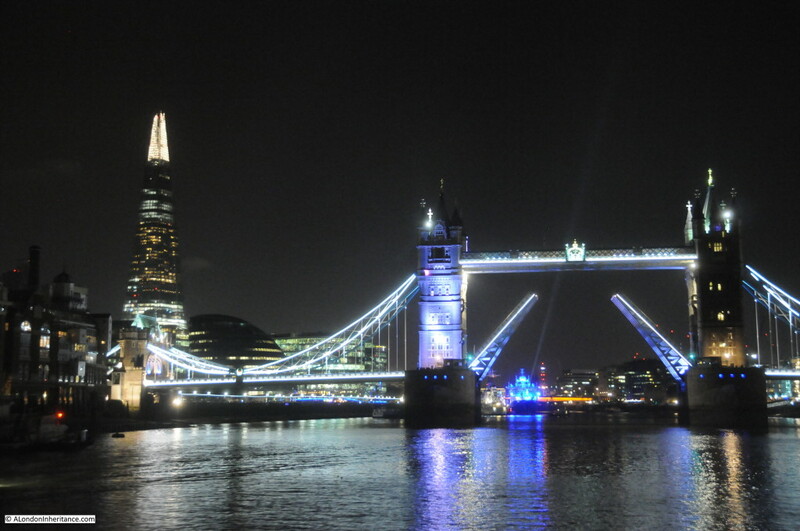 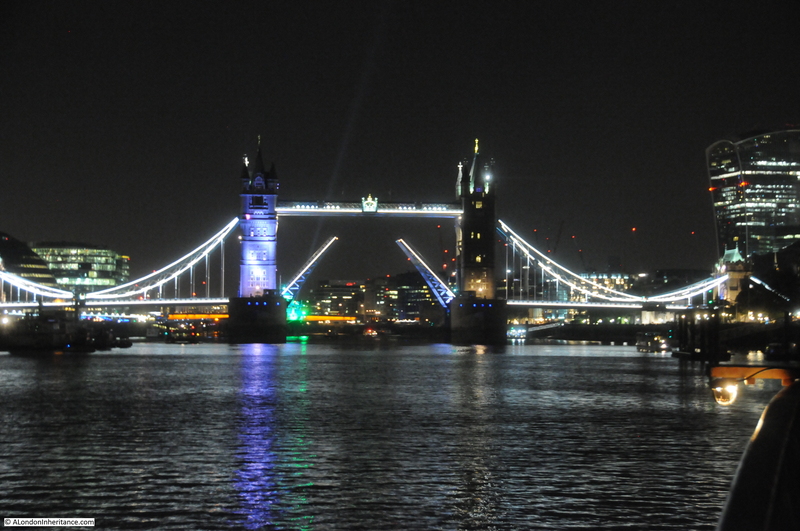 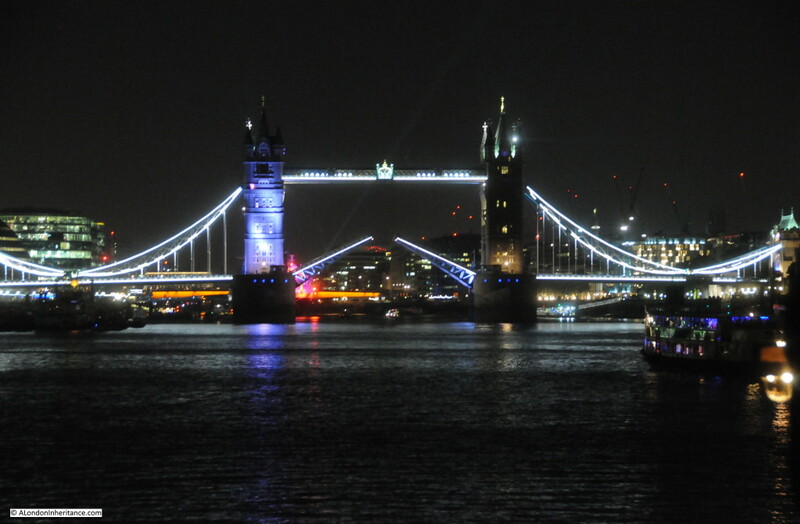 The following photo is why I wish I had taken photos along this stretch of the Thames some years ago. 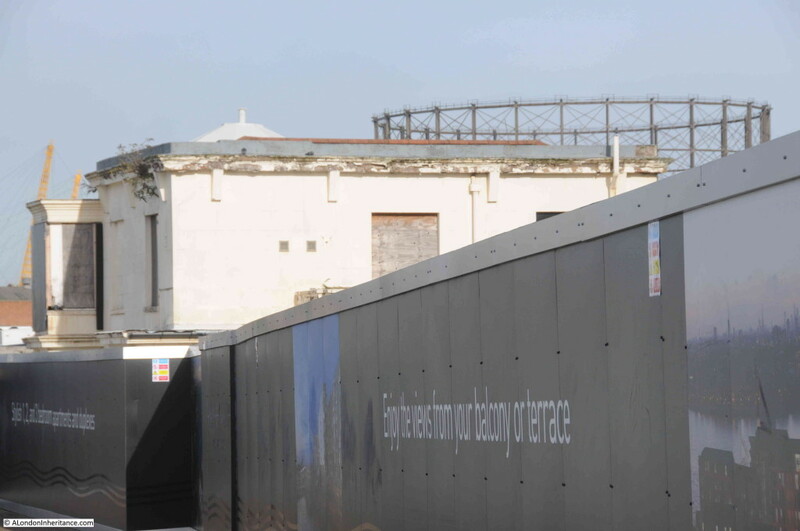 Hoardings now block of the factory site, but only the original Enderby House remains. 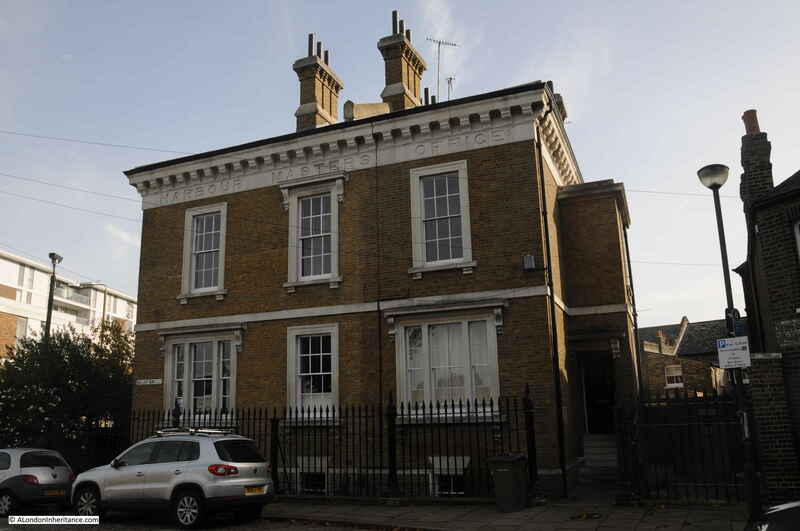 This is a listed building, built around 1830, but looks to be in a process of slow decay. 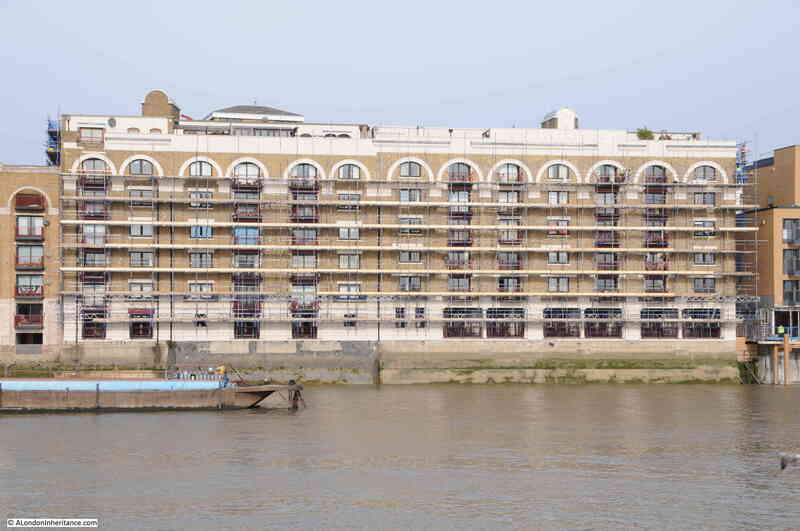 The Atlantic Cable and Undersea Communications website has lots of detail on Enderby House and how the building has decayed. 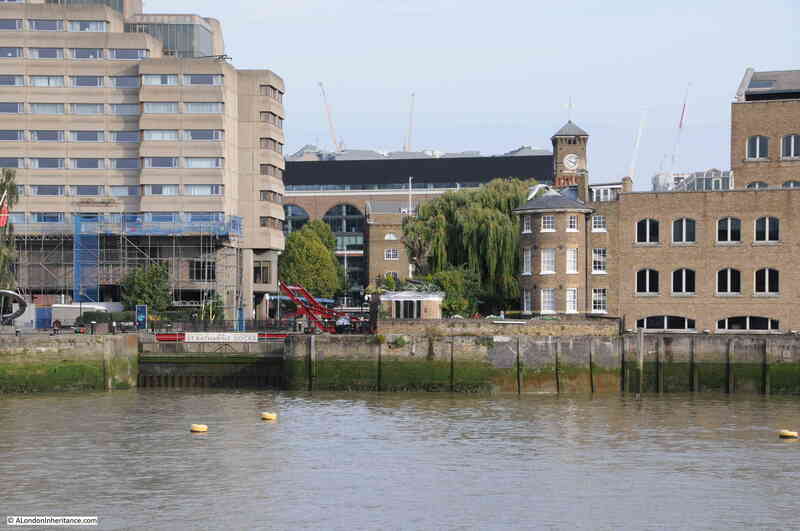 All I can do now is climb on the river wall and try to look over the hoardings. 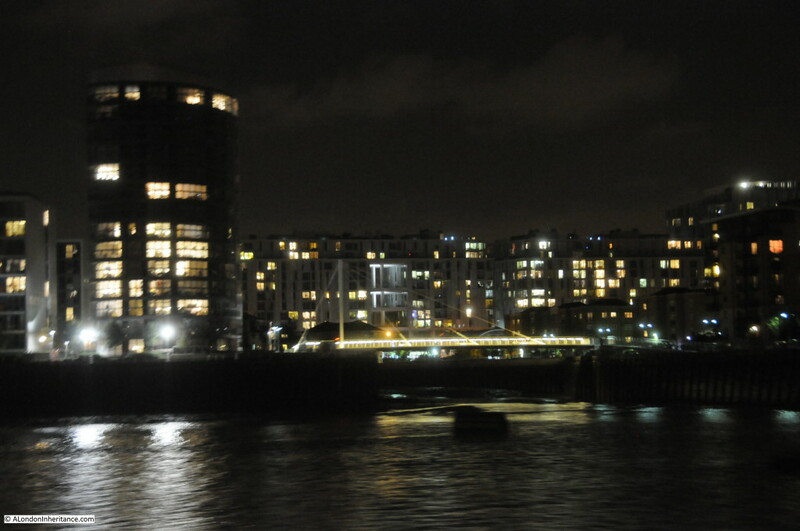 Looking onto Enderby’s Wharf. 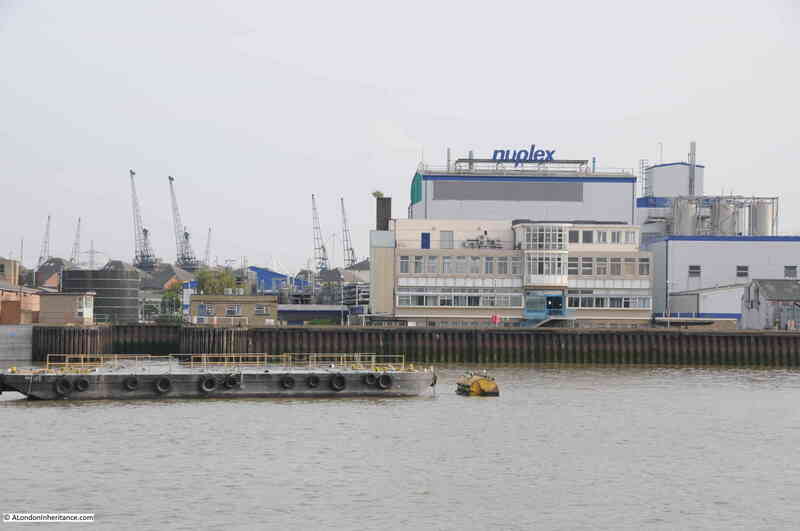 Cable being run onto ships would have crossed directly above on its route from the factory. 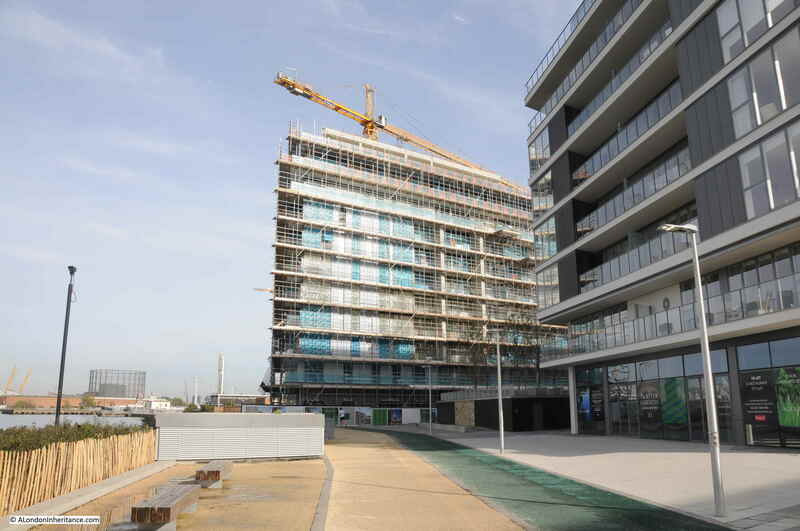 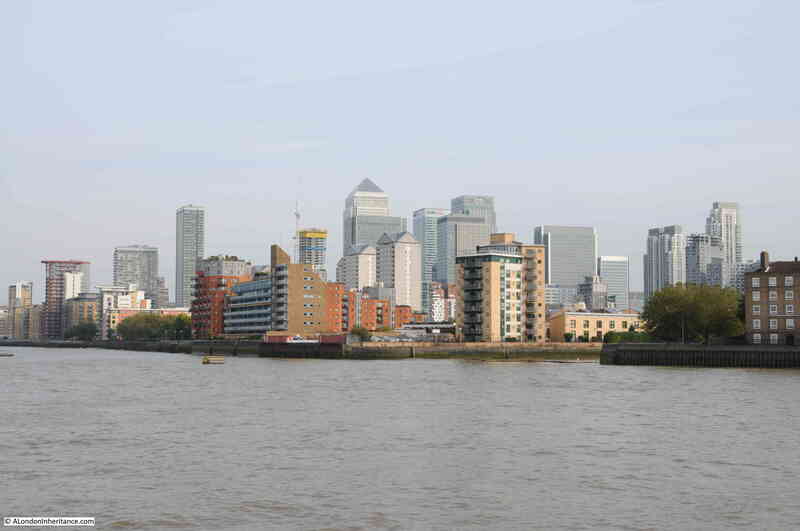 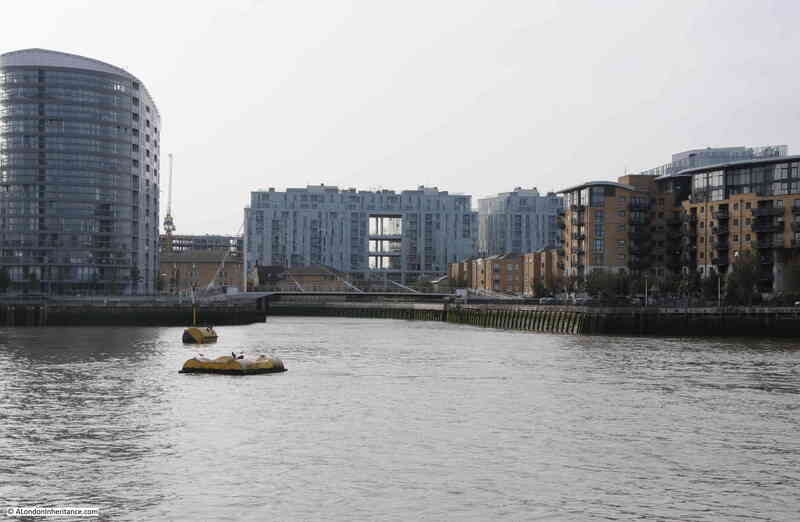 How Barratt Homes plan to develop Enderby Wharf can be found here. 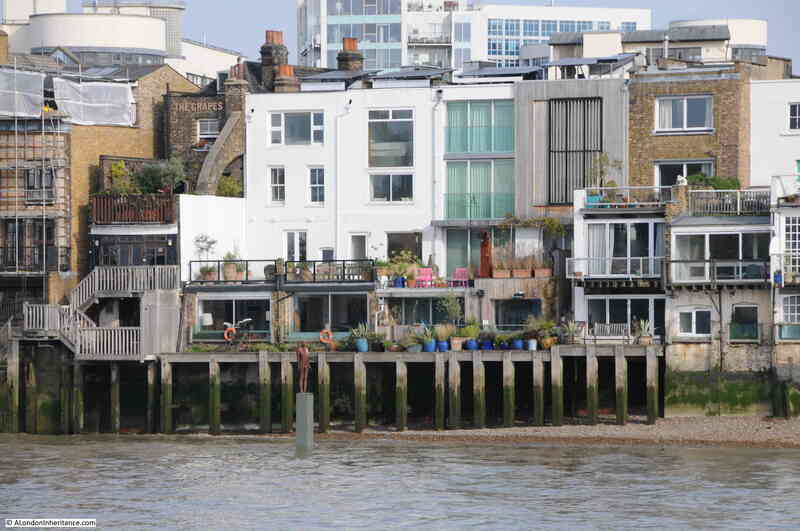 Look into the river and a set of steps running down into the Thames can be seen. 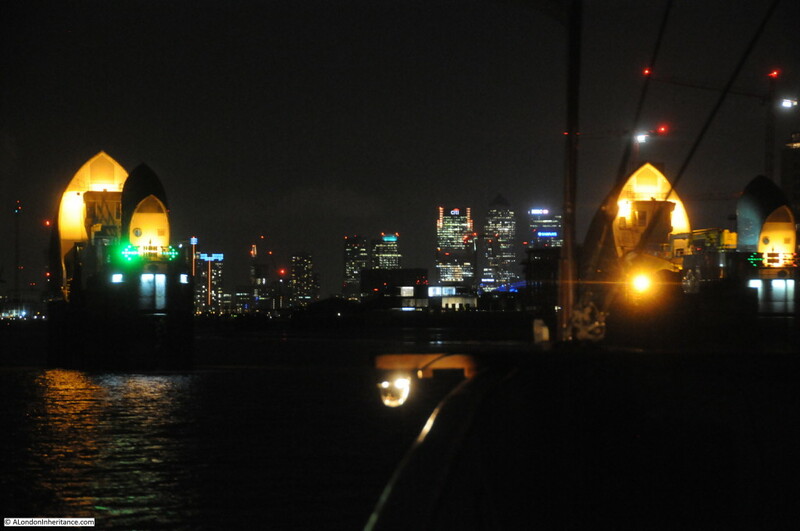 These are the Enderby Wharf Ferry Steps. 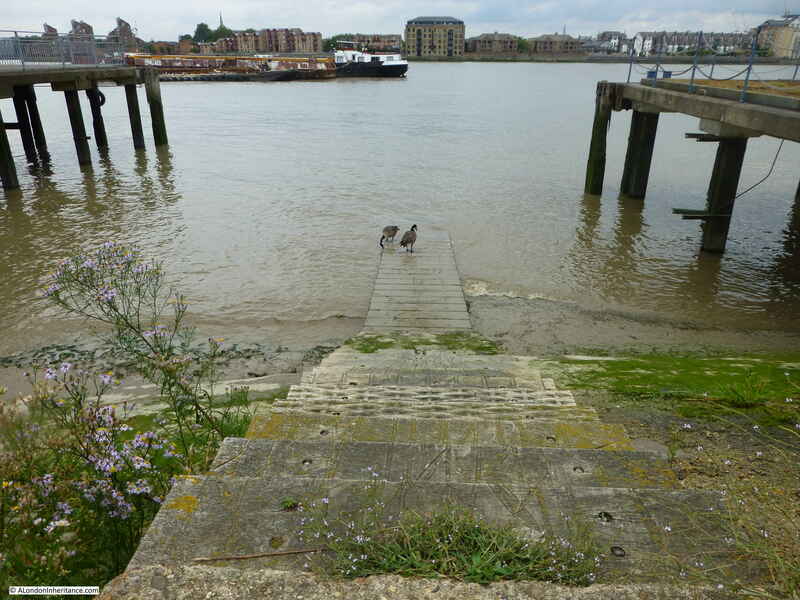 Whilst steps into the river have been here for many years, these steps are recent, having been installed in 2001. 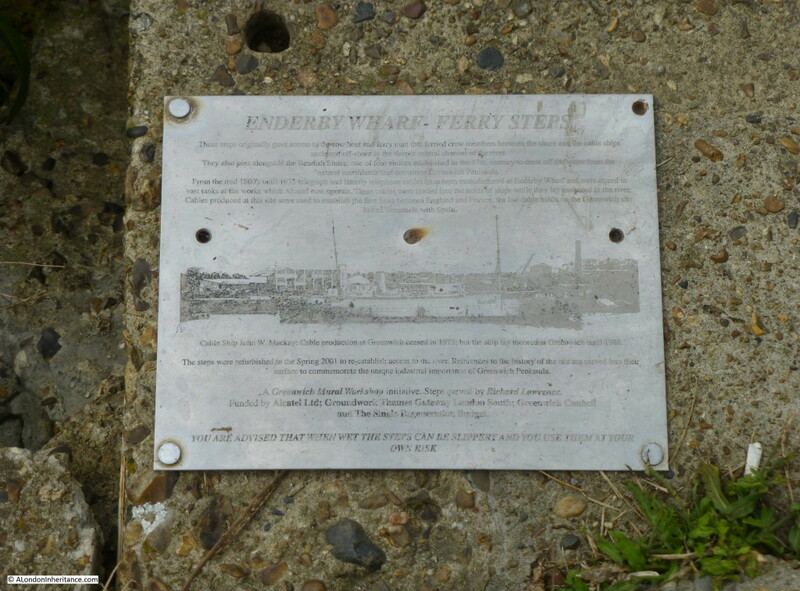 The plaque at the top of the steps. 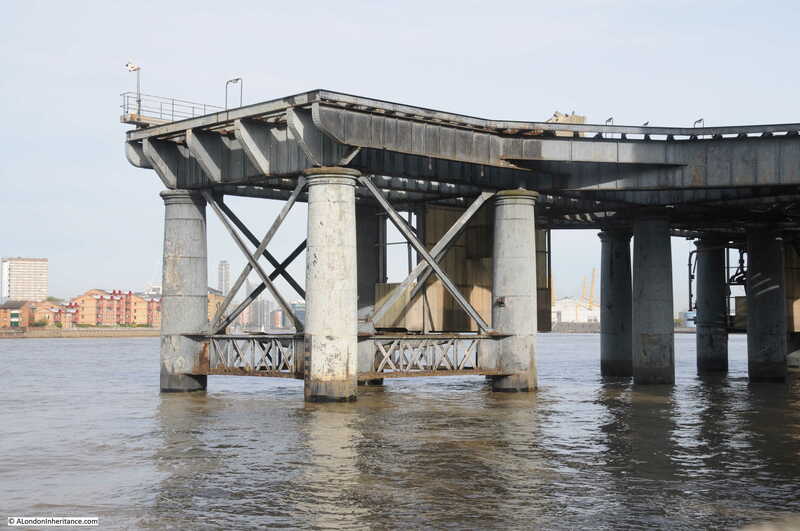 These steps originally gave access to the row boat and ferry man that ferried crew members between the shore and the cable ships anchored off-shore in the deeper central channel of the river. 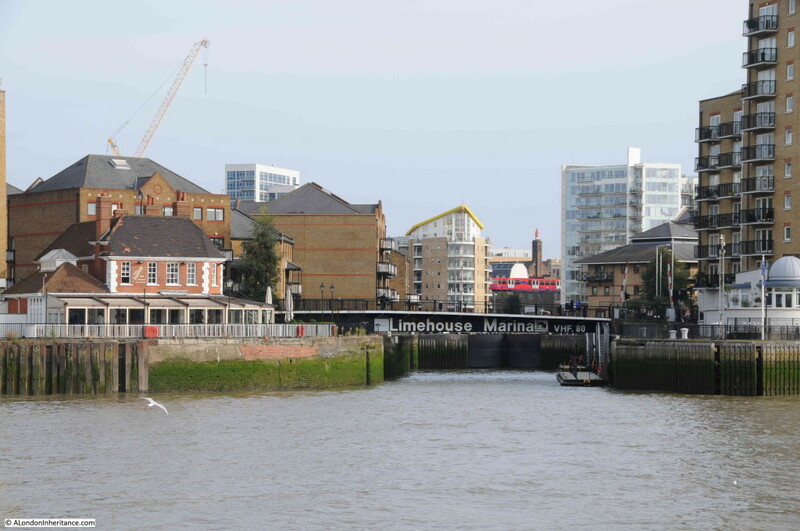 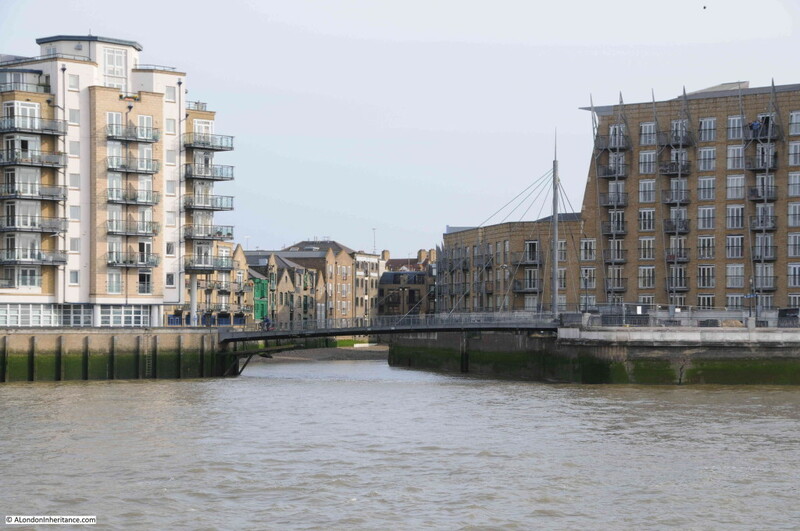 They also pass alongside the Bendish Sluice, one of the four sluices established in the 17th century to draw off the water from the natural marshlands that constitute Greenwich Peninsula. 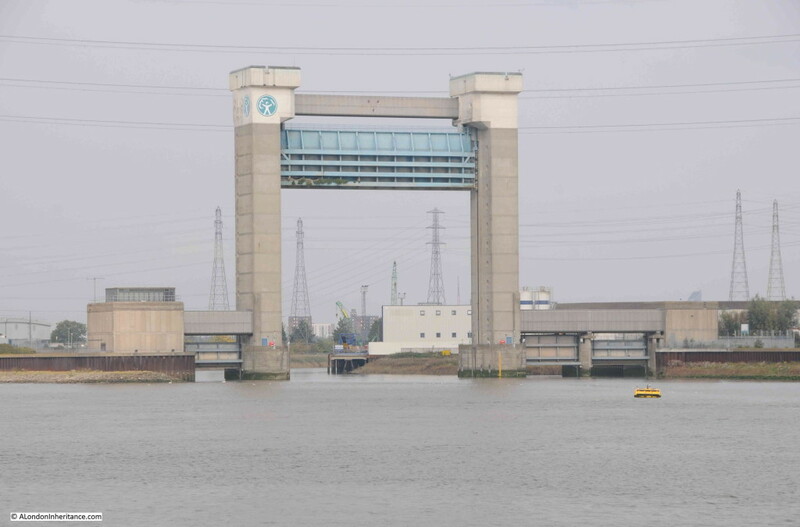 From the mid 1800’s until 1975 telegraph and latterly telephone cables have been manufactured at Enderby Wharf and were stored in vast tanks at the works which Alcatel now operate. 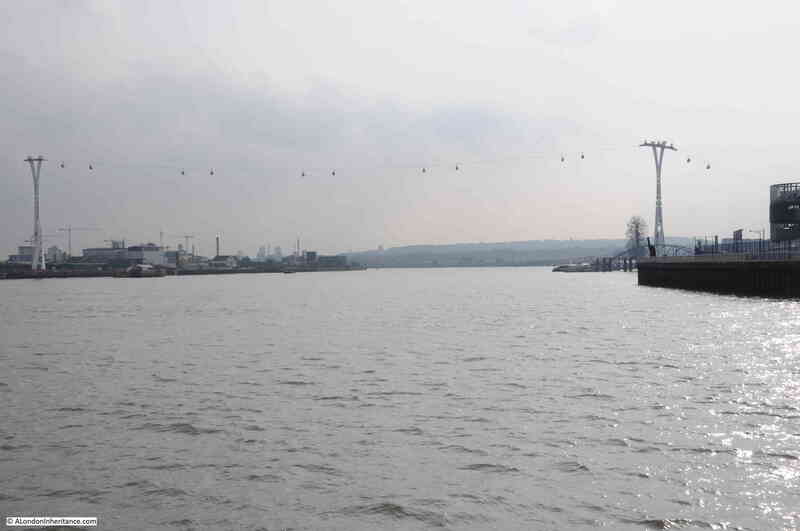 These cables were loaded into the holds of ships while they lay anchored in the river. 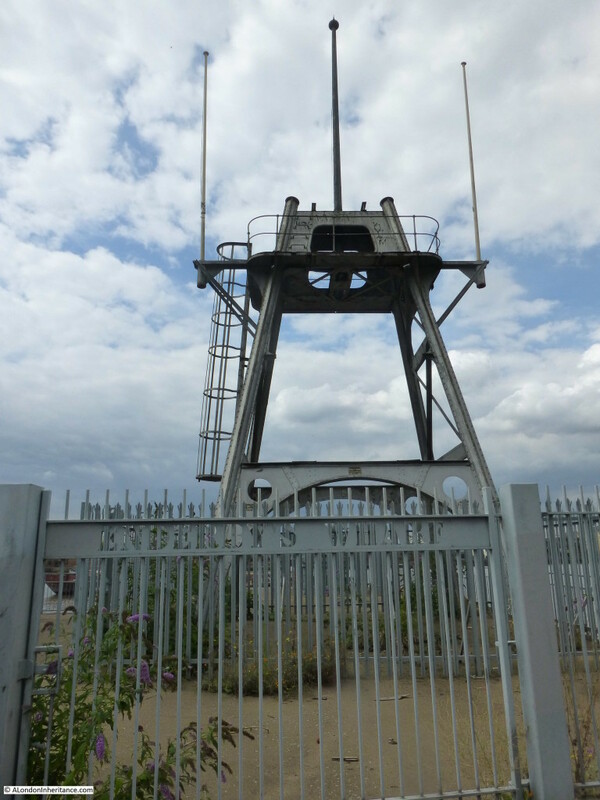 Cable produced at this site were used to establish the first links between England and France; the last cable made on the Greenwich site linked Venezuela with Spain. Another view of the cable transfer machinery. 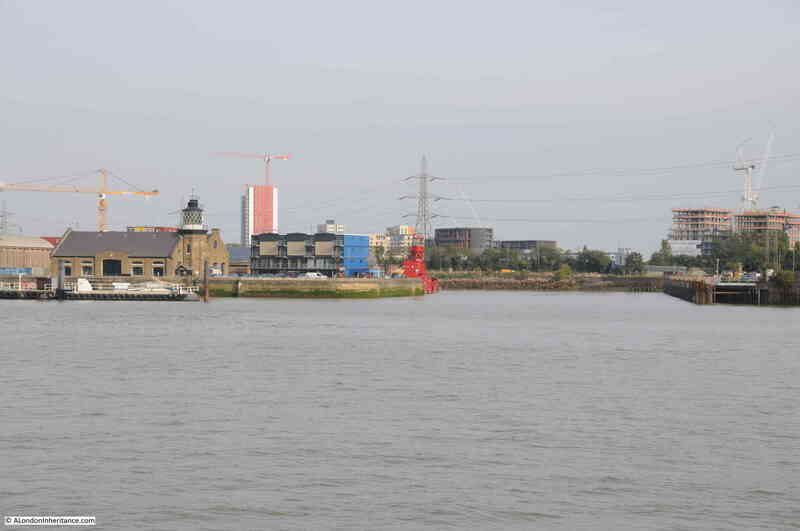 It is in this area that the cruise terminal is planned to be built. 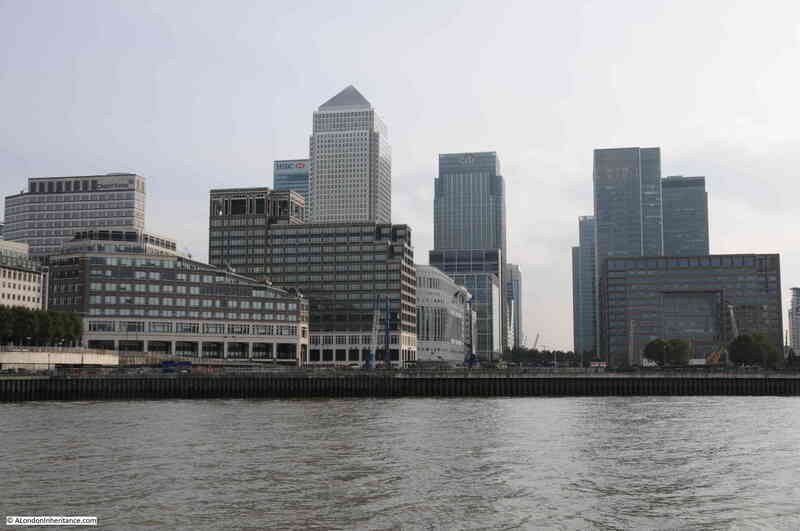 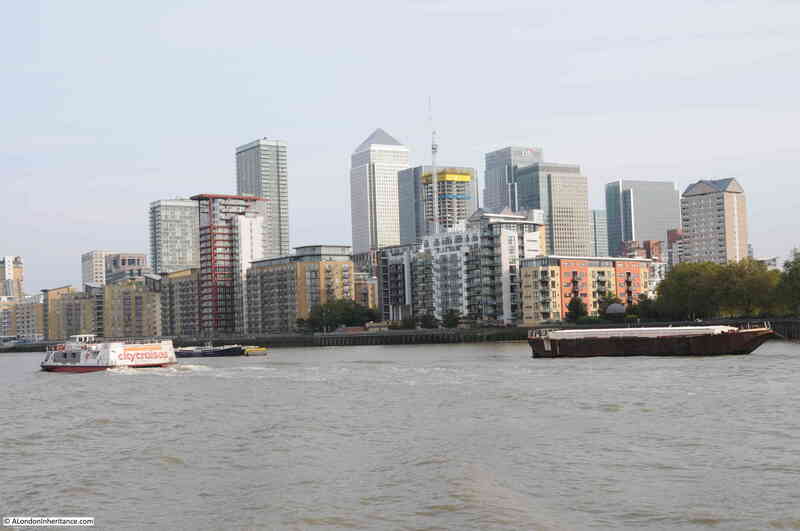 The London City Cruise Port will be at Enderby Wharf and will allow mid-sized cruise ships to moor at a site with easy access to Greenwich and central London. 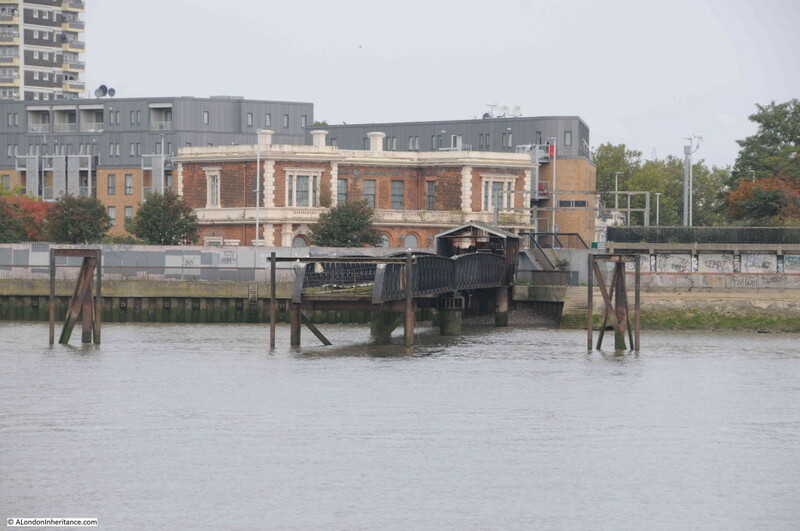 I only hope that Enderby House, the original cable transfer machinery and the Enderby Wharf Steps are retained and protected. 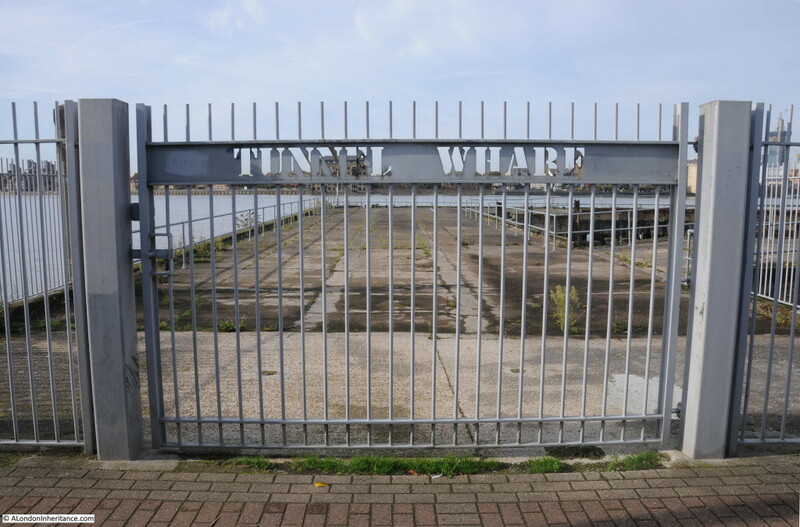 A short distance past Enderby Wharf is Tunnel Wharf. 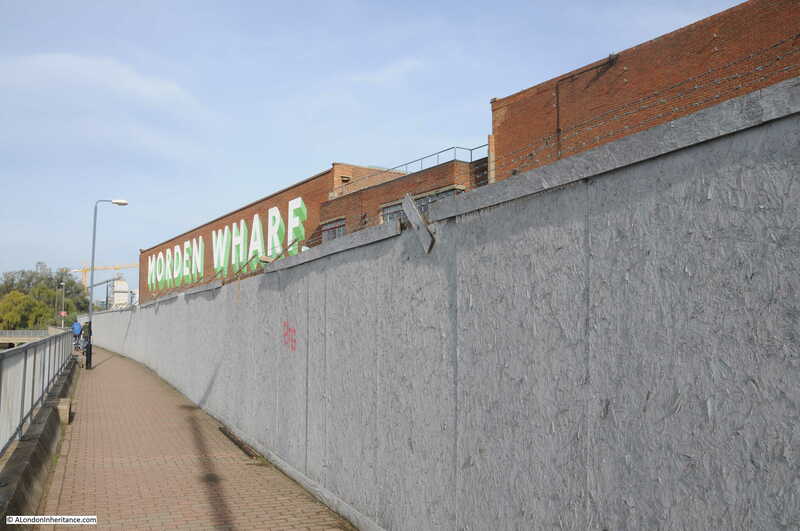 And the hoardings continue to fence off the areas waiting for redevelopment. 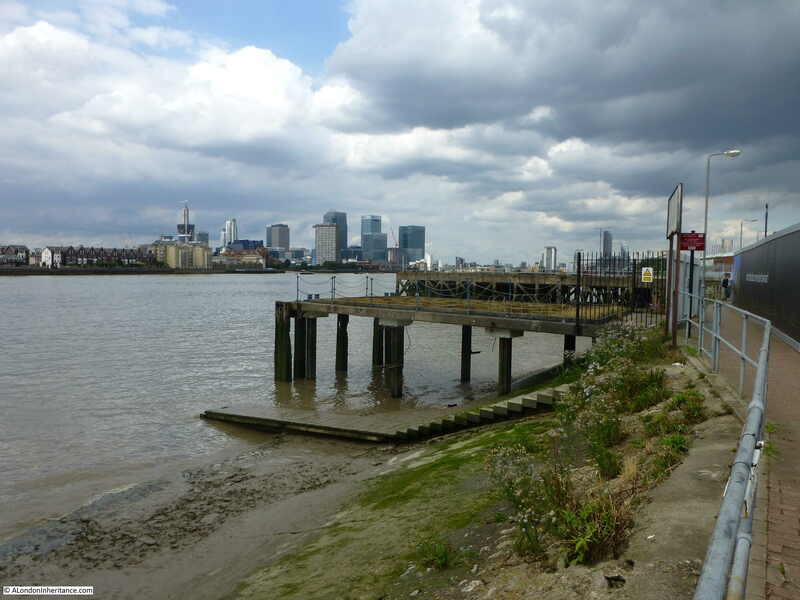 This is Morden Wharf. Parts of the path seem to have a distinctly rural quality with trees lining the slopping river bank down into the Thames. But the remains of old industrial areas soon return. 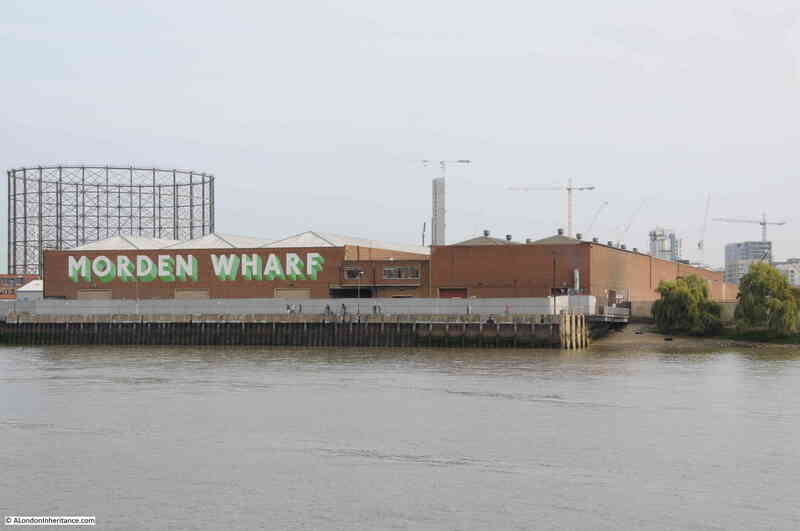 London will soon be losing the majority of the old gas holders that were once major landmarks across the city. 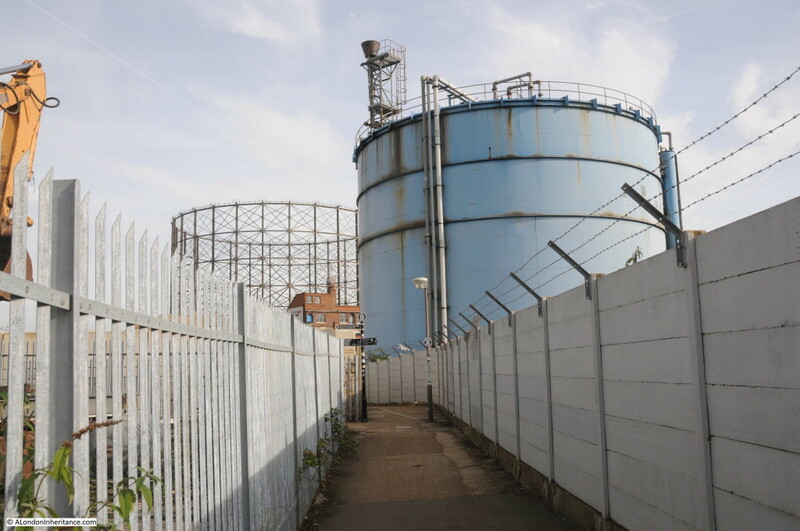 I do not know if this large gas holder on the Greenwich Peninsula is protected, I suspect not. 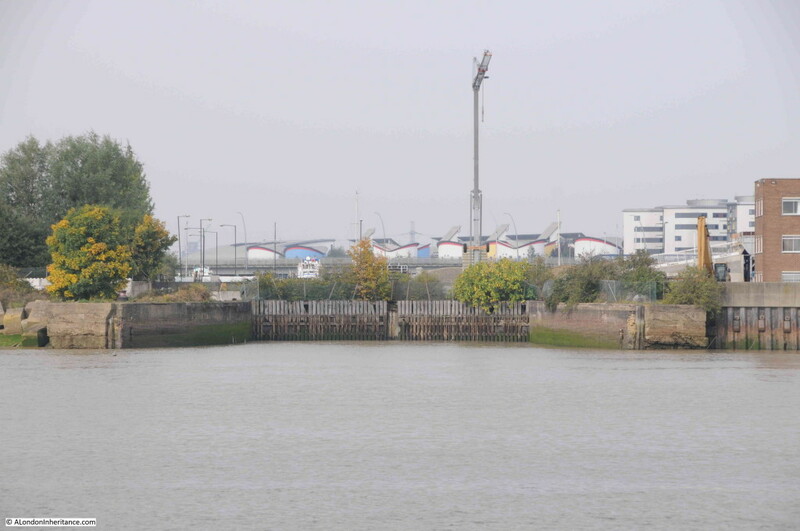 Walking past the area where some of the river’s shipping is maintained in a row of dry docks. 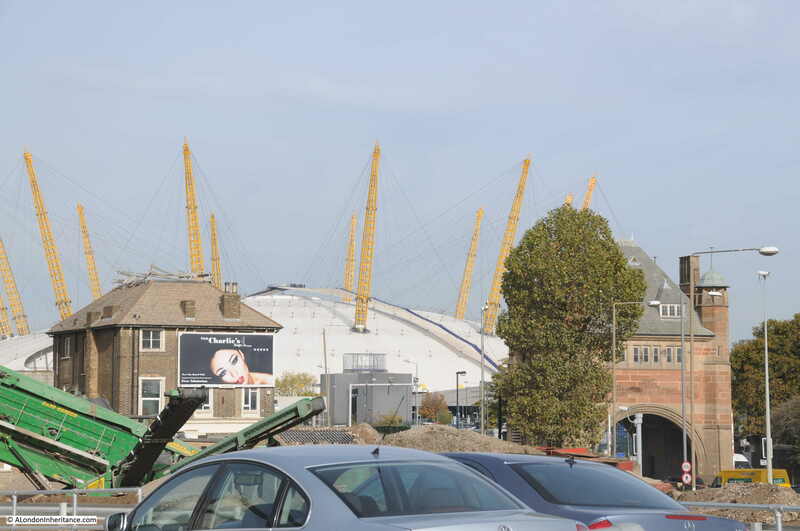 Looking across from the river path to the Dome, with the grade 2 listed entrance to the Blackwall Tunnel. The final stretch of the river walk before reaching the new developments around the O2 also have an air of waiting for a different use. 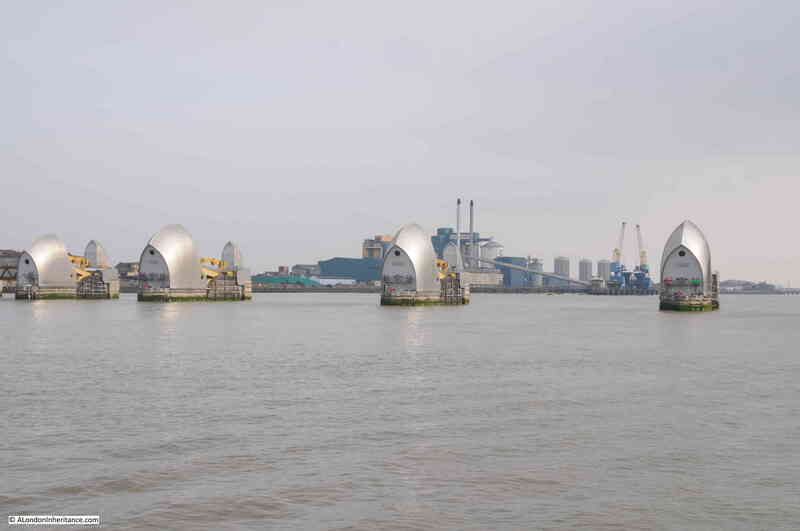 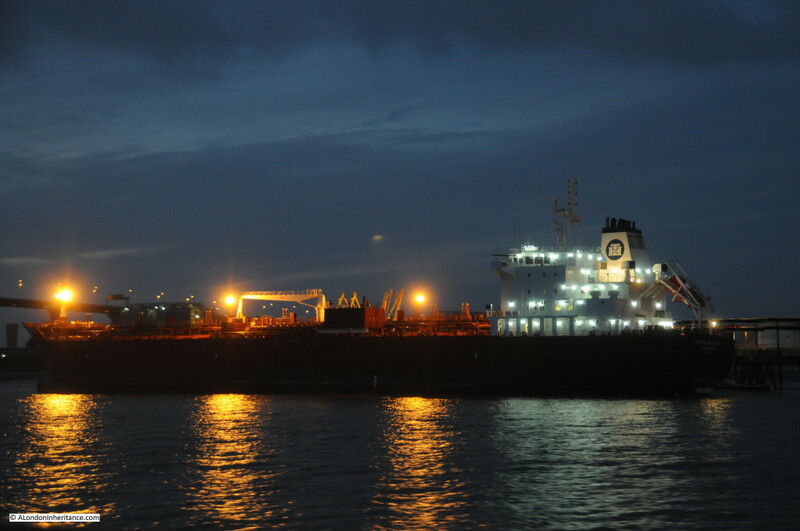 A large site is used for the storage and processing of aggregates that arrive by barge along the river. 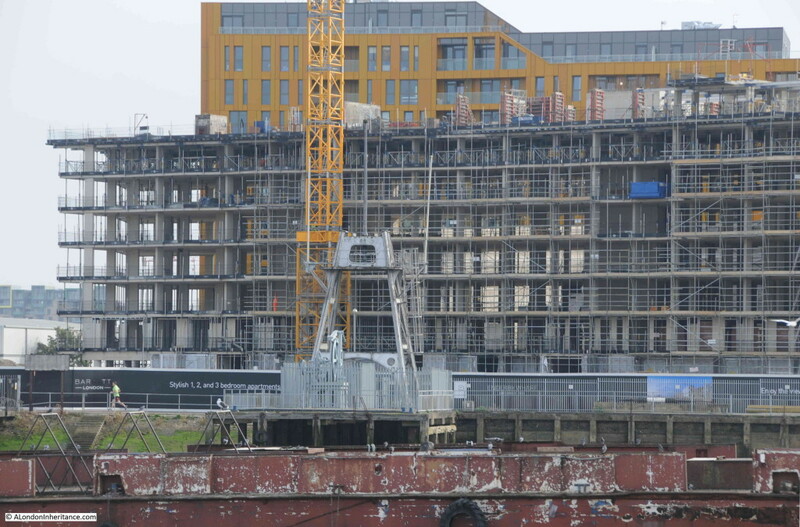 And another building site and behind, a building that I cannot understand how an architect thought would be a good design for this location. 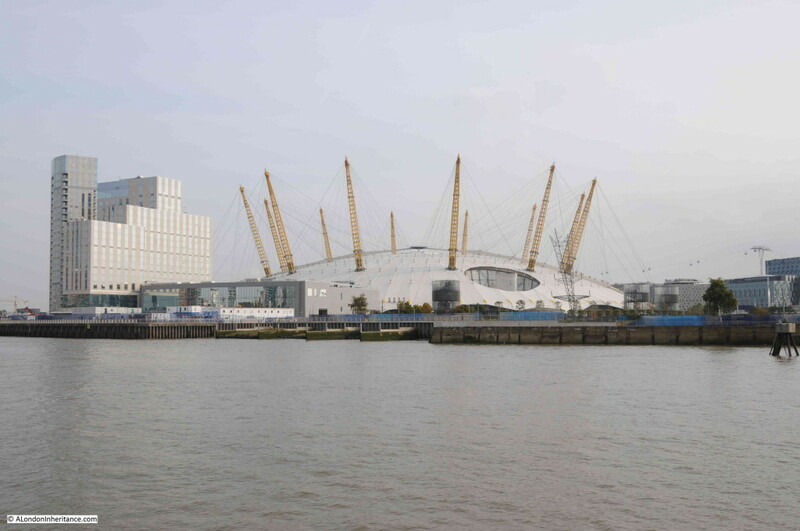 The Greenwich Peninsula has not attracted the same attention as much of the recent development in central London, however it is an area that will be changing dramatically over the next few years as stretches of almost identical glass and steel buildings run further along the river. 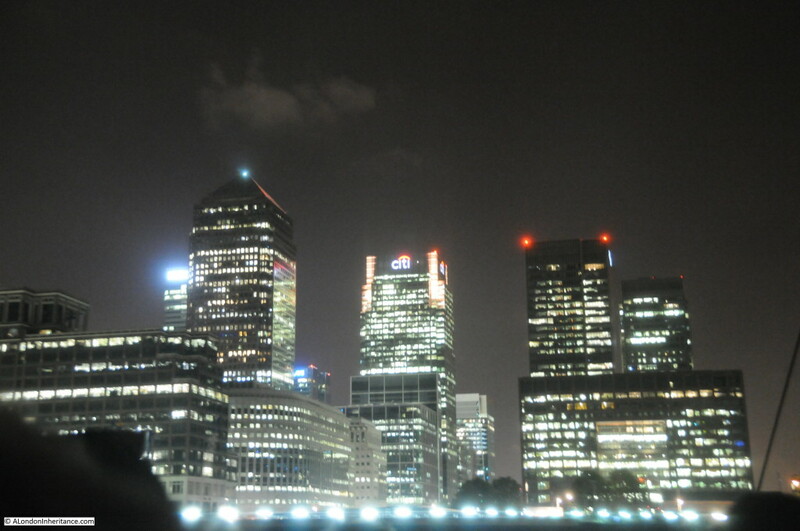 Now where to photograph next in a continually changing city? This entry was posted in London Photography, The Thames and tagged Enderby Wharf, Greenwich, Greenwich Peninsula on January 24, 2016 by admin.